I saw this quote online. It sounds dreamy and inspiring but in reality these things can be highly uncomfortable. This was the case during my recent canyoneering trip to Death Valley. My best and worst trait is my compulsion to just go for it. I do this whether I’m ready or not, especially when it comes to my adventures. 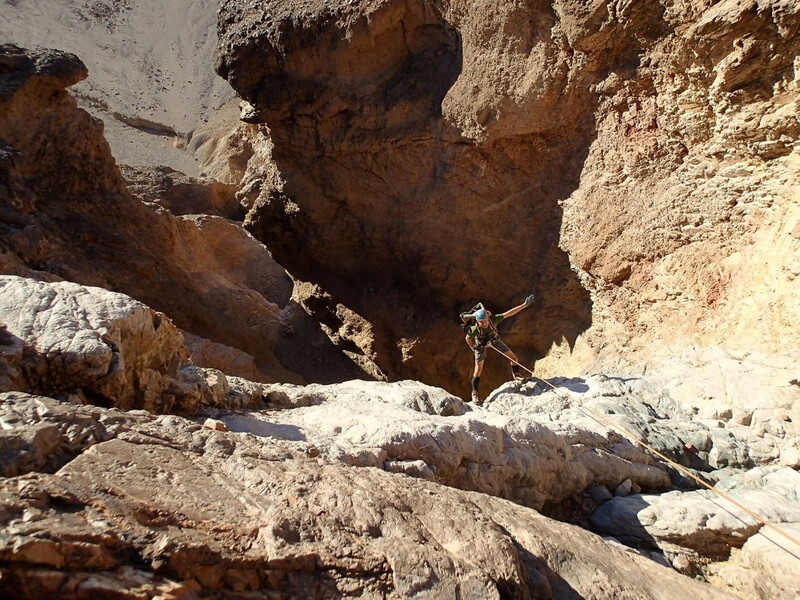 The technical canyons I did in Death Valley a couple years ago were some of my hardest ever and I hadn’t been training for my recent trip like I should have. I should have been climbing big mountains or doing big canyons to prepare my body and mind for punishment. Instead, I’ve been luxuriating on a sailboat in Mexico for the last two months. Yet there I was, climbing 1100 feet straight up the side of a mountain to reach the first drop in point for Helios Canyon, which would offer us 6 rappels with lengths up to 160 feet. This mountain I was climbing was not a friendly mountain, either. Scree and boulders of every shape and size were perched loosely on a steep slope. The better sections of the climb had some large rocks which could be trusted. 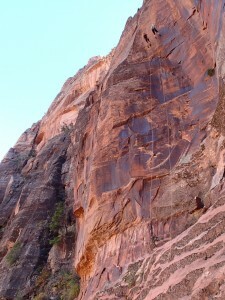 However, most parts of the climb had only pebble or grapefruit-sized rocks which would slide and shift with every step. This wasn’t a single mountain we could walk all the way around, but rather a dark brown fold in a long row of 6,000 foot peaks. This row of peaks rose suddenly from a flat, wide, pale yellow valley floor. 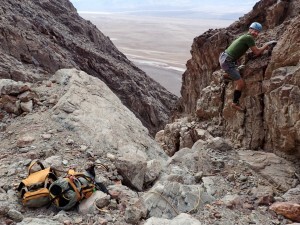 As we planned our canyons for the trip I felt intimidated when I read about the ascent to reach the entry to Helios canyon, which described loose rock, scree, and scrambling along a knife edge ridge. 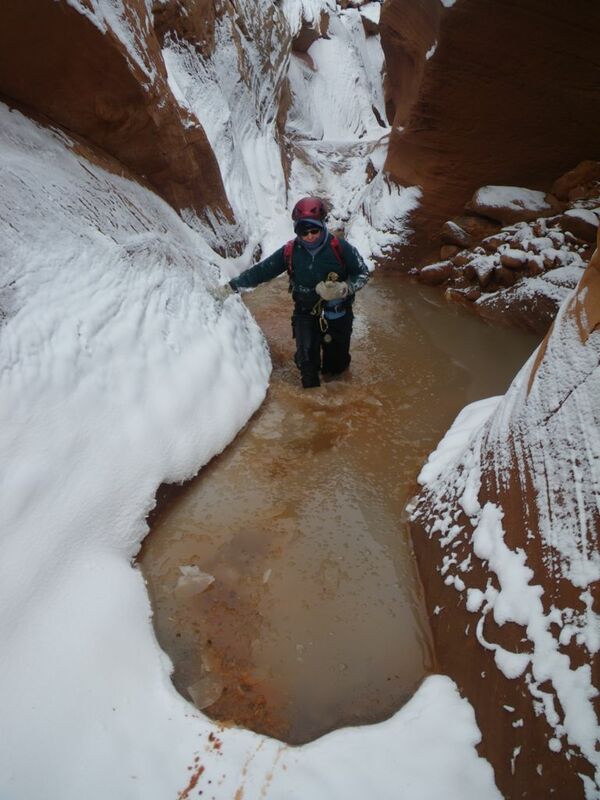 We chose to do it anyway because it’s one of the shorter and prettier canyons in the area. Short and pretty does not equal easy in Death Valley, though. 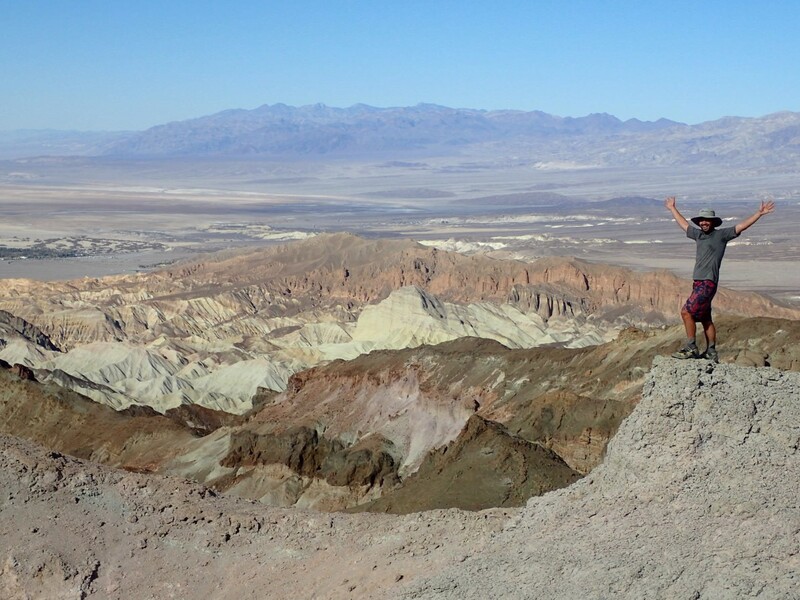 There are no easy canyons in Death Valley. Brian, Louis, Everett and I were a happy canyon team as we carpooled to the start of our adventure. When I first saw the mountain we would climb I knew I was in over my head. Patches of scree and boulders rose steeply to a solid, rippling cliffband about 700 feet from the base of the mountain. I couldn’t see the knife edge ridge yet but I knew it was up there somewhere, waiting for me to crawl humbly across it. My previous canyoneering trip to Death Valley had been one of my hardest trips in 9+ years of canyoneering. I descended a canyon full of loose rock during a canyon exploration along Badwater Road. The canyon was so bad that Tom Jones, who organized the exploration, joked “We did it so you don’t have to” in his trip report. There was so much dangerous rockfall we named the canyon “ROCK!” because we were constantly yelling “rock” to each other to alert our partners of falling rock. However, the landscape was unique and the approach hikes were beautiful. It was clearly a great place for canyoneering, but also one not to be taken lightly. 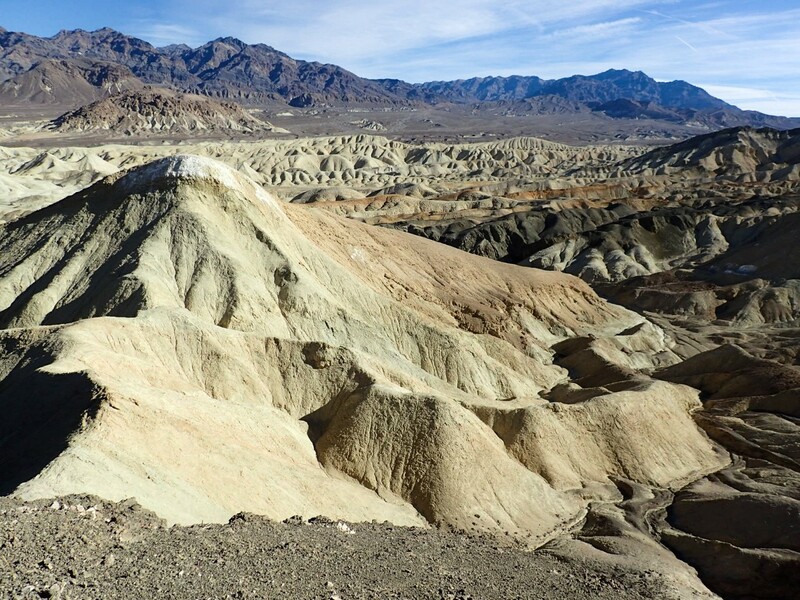 Now I returned to Death Valley for the second time, more aware of the magnitude of its canyons. Even though I knew the risks, I still couldn’t resist Helios canyon that day. My lust for the canyon overcame logic and I felt that urge to just go for it. I decided to do it. That decision began a challenging day where I relied on help and encouragement from my canyon partners to make it up the mountain safely. As I moved up the mountain, rocks fell from under my feet. I was in the middle of an easy climbing move on a large rock when the smooth, stable platform under my feet disintegrated in an instant and its remnants tumbled toward Louis and Everett below. Rock! I yelled. 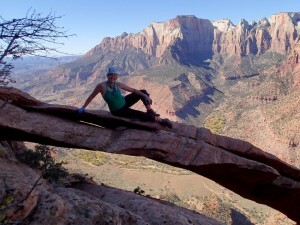 I panted, gripped the remaining rock with my hands, and looked for another place for my foot. Brian would sometimes secure a short rope to himself and toss it to me to help me make it up some of the steeper, looser sections. There were many I love you’s, good job’s, and smiles coming my way as I made it up the mountain. A few times I yearned to turn back but my canyon partners encouraged me to keep going. Then, we saw the knife edge ridge. It was not skinny, exposed, or frightening but by that time the wind was blowing so hard it was difficult to stand up straight. We saw a place where we thought we may be able to drop into the canyon early and avoid the knife edge ridge. It was a rocky slope that descended toward the floor of Helios canyon, but we couldn’t quite see the bottom of the slope. One by one, we rappelled or used a handline to make our way down the slope and see if we could find a way to the canyon floor. The wind was too loud to communicate and the drop appeared to be longer than our longest rope, so we couldn’t send just one person all the way down to scout it. Brian, Everett and myself descended 100 feet down the drop and then decided it was far too dangerous to try rappelling on the rotten rock at the bottom of the slope. We looked around for other options, but eventually accepted we would need to ascend all the way back up to the ridge and continue on the knife edge in the howling wind. The wind turned out to be only a minor obstacle for us. We stayed on the downwind side of the ridge whenever possible, and Brian threw me a rope as I made my way up the knife edge portion of it. We all felt relieved when the mountain climbing portion of the adventure was over and we were ready to drop into the canyon. The final drop into the canyon held yet one more surprise for us. 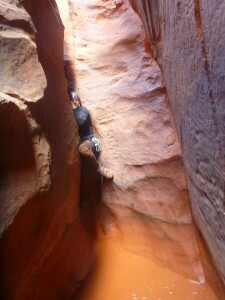 To get into the canyon, we needed to downclimb a short distance on secure rock. This would normally be a simple move, but the climb was next to a big, airy drop. By that point I had enjoyed enough excitement and I rappelled off Brian into the canyon rather than doing the exposed downclimb. Brian, Louis and Everett seemed to really enjoy the exciting climb. Good for them. I sat in the canyon celebrating with a sandwich. The canyon itself was very rewarding once we were in it. Nearly every drop, large or small, was framed by enormous views of the peaks across from us and the big, yellow plain below us. The rock under our feet changed constantly, from slick gray to jagged, tan conglomerate to rippled brown. I tried to shake off the tension of the approach but I don’t think I completely relaxed until we reached the car at the end of the canyon. That mountain felt like something I couldn’t climb safely and I wasn’t in the best condition to tackle difficult terrain, but I’m glad I did it anyway. I still believe in the words “Do things that are hard. Do things you think you can’t do,” but with the added phrase “in the company of people who care”. 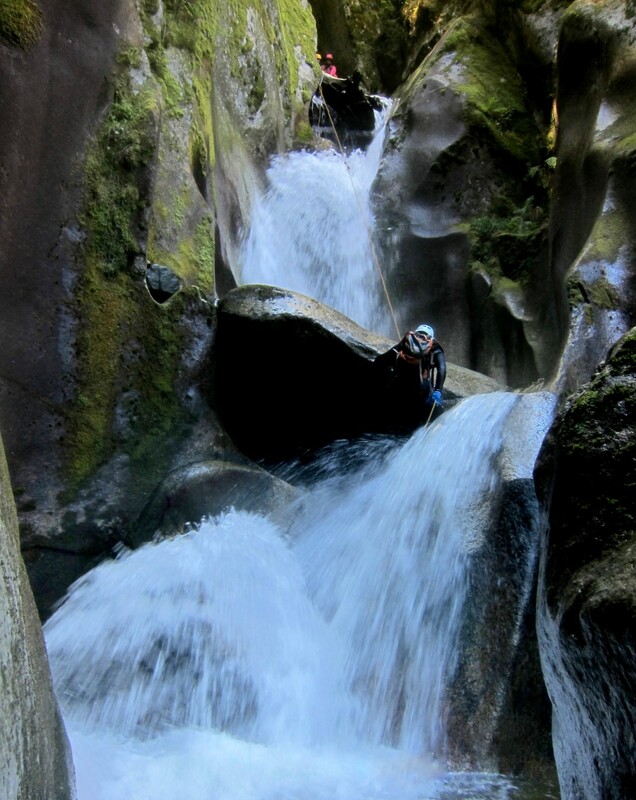 Idaho Canyoneering Soon to be on Television! I’ve watched the television show “Outdoor Idaho” since my childhood, and as an adult it is still one of my favorite shows. 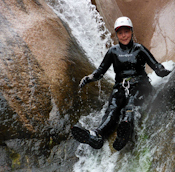 I was ecstatic when Bruce Reichert, the host of Outdoor Idaho, asked me to organize a women’s canyoneering show! I got busy right away with planning and dreaming about how to maximize this incredible opportunity to showcase Idaho’s remote canyons and the unique dynamic of a group of female canyoneers romping through the wilderness. 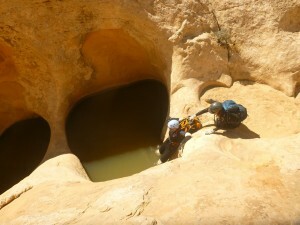 I started canyoneering in Idaho in 2012 as a way to explore new places in the state where I had lived most of my life. I had no idea it would lead to an appearance on Outdoor Idaho! Although I love planning adventures for friends, I had no idea how to produce a compelling television show. Luckily I was paired up with Sauni Symonds, a very talented producer who is also an awesome outdoors person. I would go on an adventure with her any day. Sauni helped me plan the itinerary and select the participants. Her vision for the show included a very remote location where few people go, a group of women of various ages and backgrounds, and a challenging backpacking and canyoneering trip. 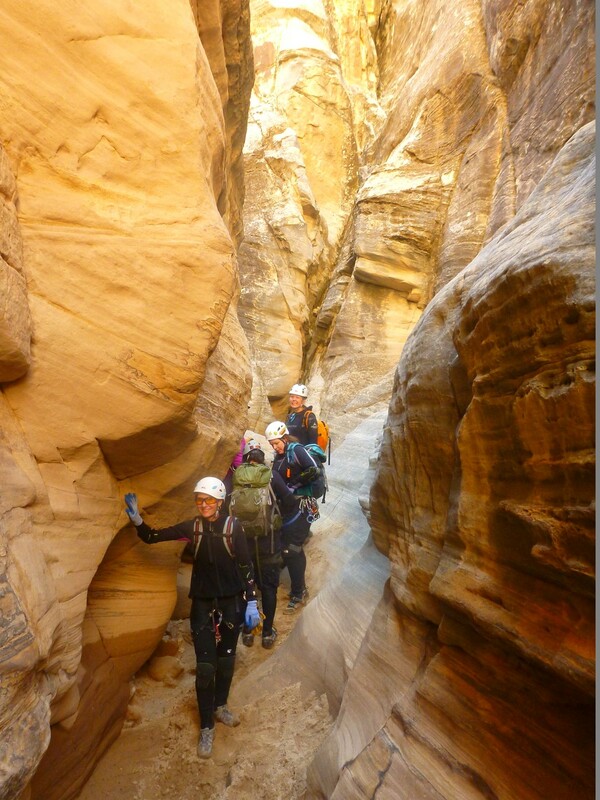 She also suggested we include some mother/daughter canyoneering teams, which added a wonderful dynamic to the group. While living my vagabond lifestyle from the van and sailboat, I planned the trip and worked with Sauni via phone and email. When she suggested including a mother/daughter team on the show, I interviewed people on the phone from the cockpit of our sailboat in Mexico. Sometimes the phone reception worked, sometimes not. Eventually I was able to complete all my phone calls. I was apprehensive about inviting ladies I had never met but there was just no way to meet them before the filming – my vagabonding schedule was too packed. I ended up inviting a mother/daughter team to join the show that I hadn’t met because they sounded really inspiring on the phone. I also invited another mother/daughter team I already knew and several other friends from different walks of life. 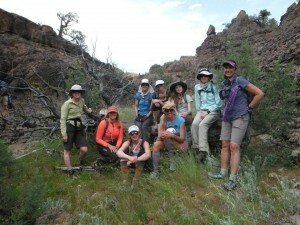 I had total confidence in all of the ladies and felt I could get the group through the canyons safely. The biggest question in my mind was how people would handle the 90 foot free hanging rappel near the end of the adventure. 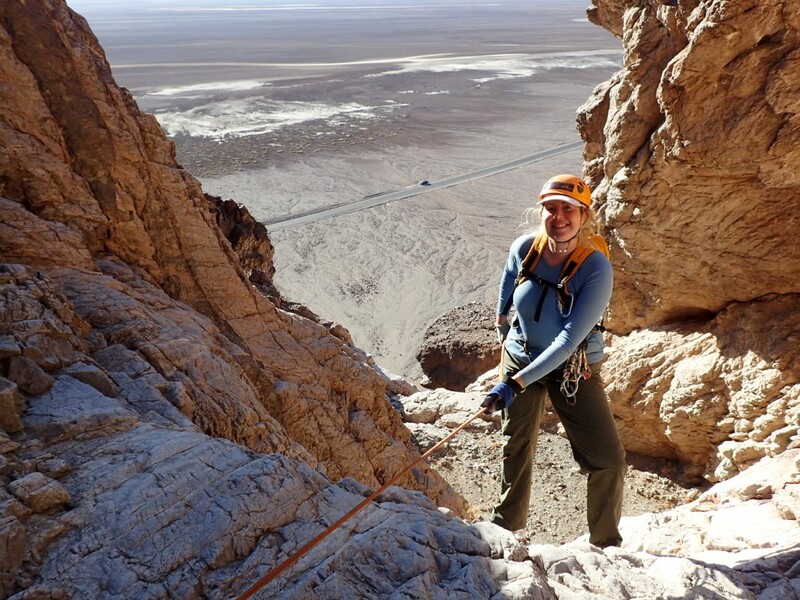 It’s a big, airy rappel with a high freak-out factor. Wouldn’t this dramatic moment make good television? I also suggested that at least one of the ladies rappel in a bikini. Now, that will definitely make good television. Before the filming, Brian and I went on a two day scouting trip to find out as much as possible about the area where we would be filming. It had been a couple years since I had explored this area. The scouting trip turned out to be a grueling expedition with plenty of bushwhacking and off trail hiking. My feet were blistered and sore by the end of the weekend. We suffered so the group wouldn’t have to, and picked a smooth route where we could enjoy great slot canyons without having to fight our way through brush. We found a wonderful cave coated in rat amber (petrified rat urine) which had been shown to me on a previous trip but was difficult to find since it was buried in a maze of slot canyons. Brian was very supportive throughout the entire process of filming this show. Not only did he help with the scouting trip, but when it was time for filming he helped carry the heavy camera gear and hung out with the film crew as I enjoyed camera time with the girls. He encouraged me when I struggled with planning the show and making the phone calls from Mexico. He continuously pumped me up and told me this would be an awesome experience and I would do a great job leading the trip. He was truly the man behind the scenes who assisted with this adventure every step of the way. What am I thinking, inviting people on this trip I’ve never met? What am I thinking, planning a television show about canyoneering? I barely even watch television. How am I going to convince everyone to do a big, airy rappel on camera? What if I make a mistake and someone gets hurt? Whenever I do something new and out of my comfort zone I have these types of doubtful thoughts. When I approach new experiences it usually feels like I’m not ready yet, and that’s how I felt about leading this trip. Often, those things I’m not ready for become my most treasured memories and this show was no exception. When it was time for the filming, I felt relaxed and enjoyed being in front of the camera. The filming of the show was a wonderful experience. Everyone was enthusiastic. The two camera experts, Jay and Seth, were great to work with. 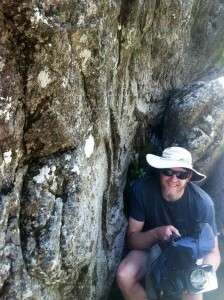 Jay scrambled all over the rocks with a big, heavy camera and a big smile on his face. Brian followed him around, carrying extra gear. My planning and scouting paid off as I lead the group through mazes of slot canyons, feeling confident about the best routes to take. It was amazing how tiring it was to start, stop, wait, set up shots, act out scenes and work with so many people with so many different needs. Filming the show was definitely harder than my regular job and at the end of each day I felt totally exhausted, but also happy and satisfied with how well everything was going. Sauni included many “mini-stories” as we filmed this episode. We wove a story with so many different chapters it is hard to know what will be included in the show when it finally airs. One member of the group was two hours late and the film crew enjoyed catching the resulting drama on film. We were approached by a local rancher at the Grand View gas station who told us we were trespassing on private land. Soon we realized there was a miscommunication and our trip would indeed take place on public land, but it was an exciting moment for me to wonder if I had made a mistake and we would need to cancel our plans! The rancher loved the show Outdoor Idaho so much he showed us his “secret canyon” on the map and even offered to haul our packs to our first camp so we wouldn’t have to carry them! He was incredibly kind and I think he would have joined us on the trip if he hadn’t had prior commitments. We didn’t have time to visit his secret canyon this trip but I do want to return to see it someday. 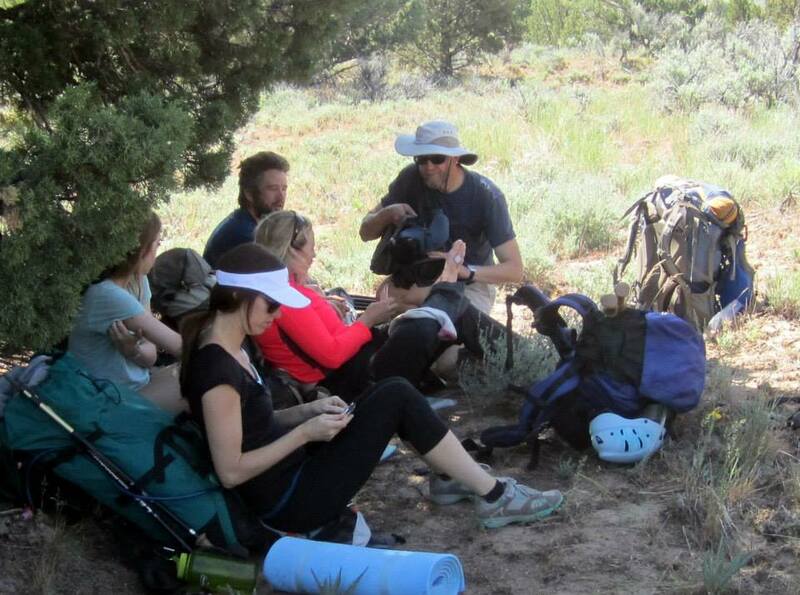 We also chose to carry our own packs, since backpacking was a big part of the adventure. 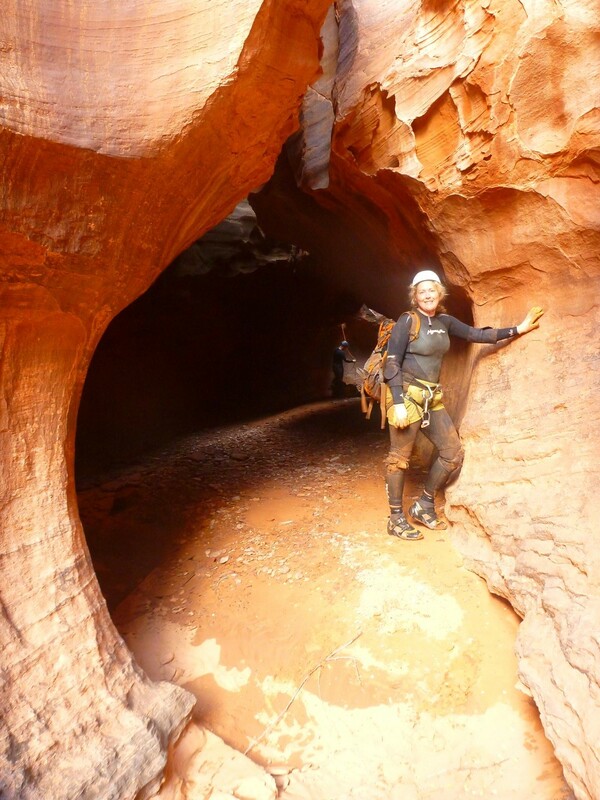 We had a great time scrambling through the canyons and exploring the rat amber cave. When the time came to do the big rappel, everyone approached it with enthusiasm. I stayed at the top to help everyone get started and to talk some of the less experienced members of the trip through the first few steps. It was a very charged moment for me. I felt responsible for the safety of the rappellers. I rigged a contingency anchor so I could lower anyone who had a problem on the rope. I encouraged the ladies who were breathing heavily, hands shaking, nervously making their way over the edge with the pool 90 feet below them. I gave away most of my carabiners to the rappellers so they could have more friction on this overhanging rappel. Finally, everyone else had gone and I was the last to rappel. 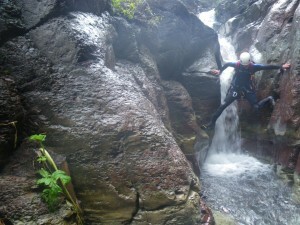 After I touched down in the pool at the bottom I felt elated that the rappel had gone so well. I felt very proud of the group. The producer conducted some interviews after the rappel. This seemed like a perfect time to interview people after such an empowering and exciting experience. Then we began the hike to the car. Our route crossed a meadow full of bull snakes. We encountered one rattlesnake earlier in the trip and now we had a chance to see many large snakes concentrated in one area. I think bull snakes are beautiful and I enjoy seeing them. I’m pleased we didn’t encounter many rattlesnakes on the trip. I thought of them often as I hiked at the front of the group, probing the bushes in front of me with my trekking poles. A rattlesnake bite could have been very hazardous in such a remote area with miles to hike and hours to drive before reaching the nearest hospital. Filming this show was a great experience and I really enjoyed working with the Outdoor Idaho crew and with the awesome ladies who added energy, smiles, courage and laughter to this show! I enjoyed being in front of the camera and would love to do more. Arizona wet canyons are a blast! 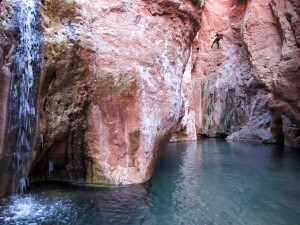 Brian and I just returned from a great canyoneering fest near Globe, Arizona. The canyons were flowing and offered great opportunities for sliding and swimming. The highlights of our trip were descending a fantastic new waterfall canyon called S’mores and going “Scubaneering” in The Jug with Jason of www.inthecanyons.com. 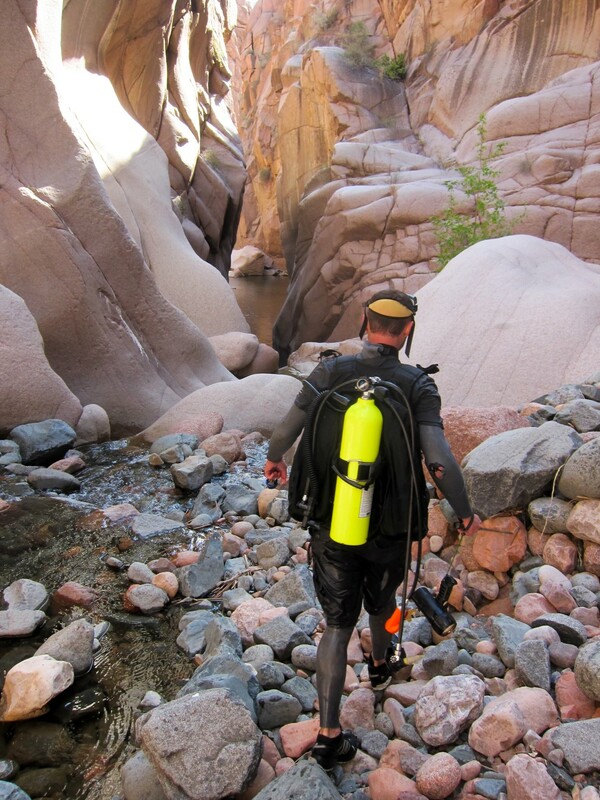 A local canyoneering guide, Jason is interested in scuba diving for lost treasure in a technical canyon he regularly takes clients through, the Jug of Salome Creek. This is just a casual canyon romp with friends, but Jason can’t seem to help himself. He’s acting as our guide, pointing out the medicinal and edible plants on the trail, giving us the “safety talk”, and generally making an easy canyon even easier with his intimate knowledge of every pool, slide, and downclimb. There are at least two appealing jumps into deep pools in The Jug. Where there are jumping canyoneers with things strapped onto them, there is canyon booty to be collected after the water yanks these things loose upon impact. Jason optimistically sports a large “lobster bag”, a mesh and canvas bag to collect the canyon booty from the bottom of the pool as he dives. He has found waterproof cameras, helmets, sunglasses and canyoneering gear at this spot in the past. He carries an extremely heavy pack with both scuba and canyoneering gear, including tanks. He needs a new waterproof camera and this is his version of “shopping”. It’s a lot more fun than the mall, and definitely cheaper! 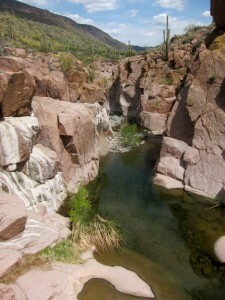 The hike into the canyon is on an easy trail punctuated with tall, proud Saguaro cacti. After a couple miles the canyon begins to poke its jagged pink edges up like crooked teeth, breaking up the scruffy green desert and appearing very alien against the prickly hills and valleys around it. Saguaro cacti line the rim of the canyon, and occasionally grow right out of the cracks in the canyon walls. “Welcome to my office”, says Jason with a flourish, referring to the tall, pink granite walls around us. 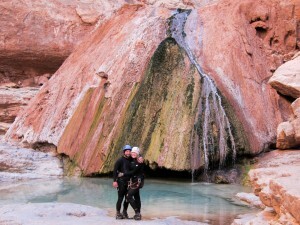 We put on wetsuits next to the rushing stream, then start walking and swimming in the canyon. Just a couple minutes downstream Jason spots a small snake with a frog in its mouth. Many tiny creatures love the crystal clear, flowing water in this canyon. Today we share the canyon with fish, frogs, large spiders, lizards, dragonflies, butterflies and beetles. Many of the Arizona canyons have wonderful sculpted rock waterslides, and soon we find an amazing slide against the left wall of the canyon. It drops about 15 feet and right in the middle we shoot through a small waterfall before plunging into the pool below. There is a “girl scout start” where we enter the rock chute with a bit less sliding and an “eagle scout start” where we slide the entire 15 feet, shooting through the waterfall with a splash in the middle. This is great fun and we all shoot down the chute and then climb back up behind the waterfall to giggle and slide again and again. This canyon has one mandatory 40 foot drop where we can either rappel a waterfall in a narrow slot, rappel down a rock wall or jump into a deep, green pool. 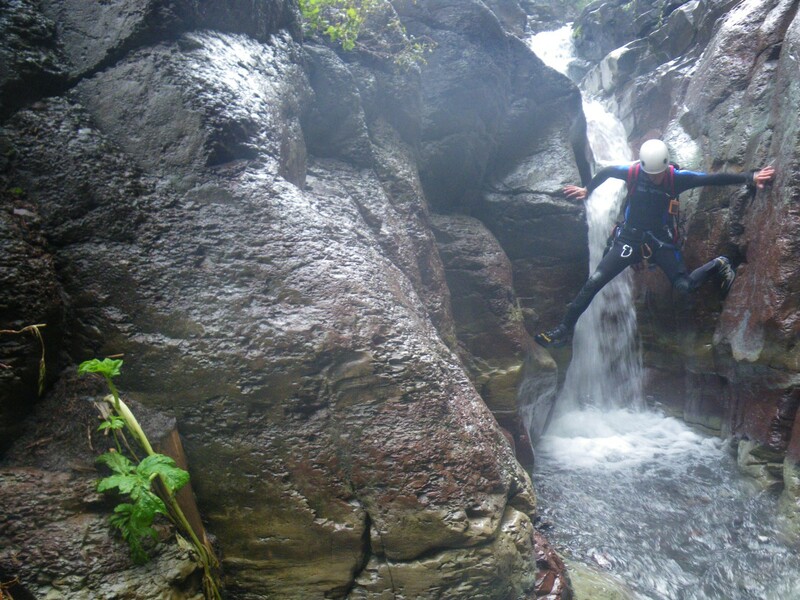 I choose to rappel the waterfall in the narrow slot and Brian chooses to jump 40 feet into the deep pool below. Jason jumps with his dive gear and prepares to scuba dive the pool at the bottom as we all make our way down. Jason prepares for the dive, using rocks and carabiners as weights. He descends below the surface until he’s just a small shadow near the bottom sending up a stream of white bubbles. He later tells us his depth meter showed the pool was 40 feet deep. Jason spends about 30 minutes in the water with his big lobster bag in two different pools. 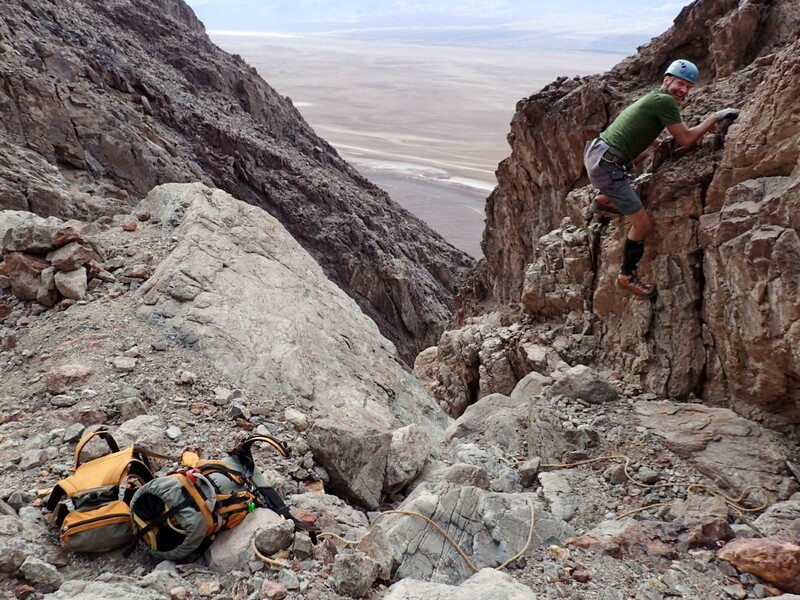 He collects a working Petzl Tikka plus headlamp, a pair of sunglasses, a rappel device and some carabiners, and even a long snake handling stick. 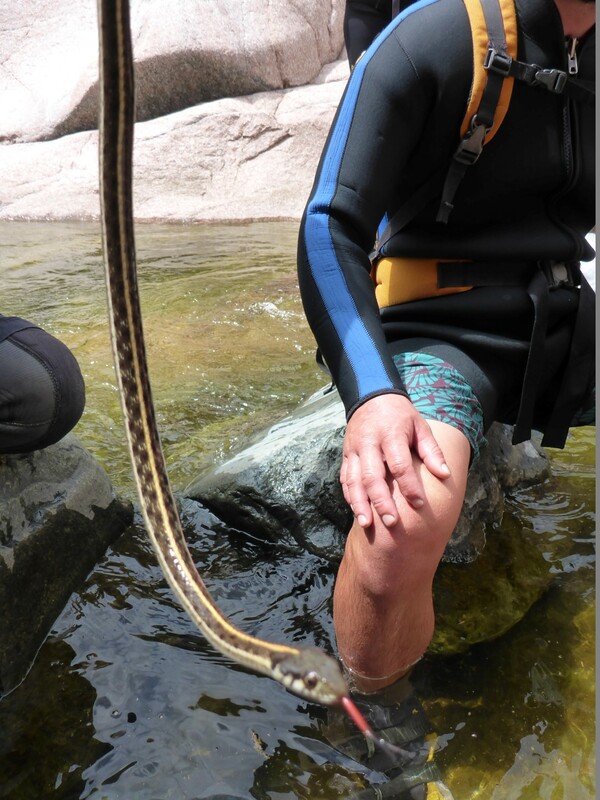 He had hoped for a waterproof camera but instead the canyon gave him a snake handling stick. That evening we used his new stick to toast marshmallows around the fire. The Jug is a fantastic, scenic canyon and I can’t wait to do it again! I really enjoyed the clear, flowing water and the chance to witness some “Scubaneering”, yet another sport I could easily be talked into. I’m a canyoneer. 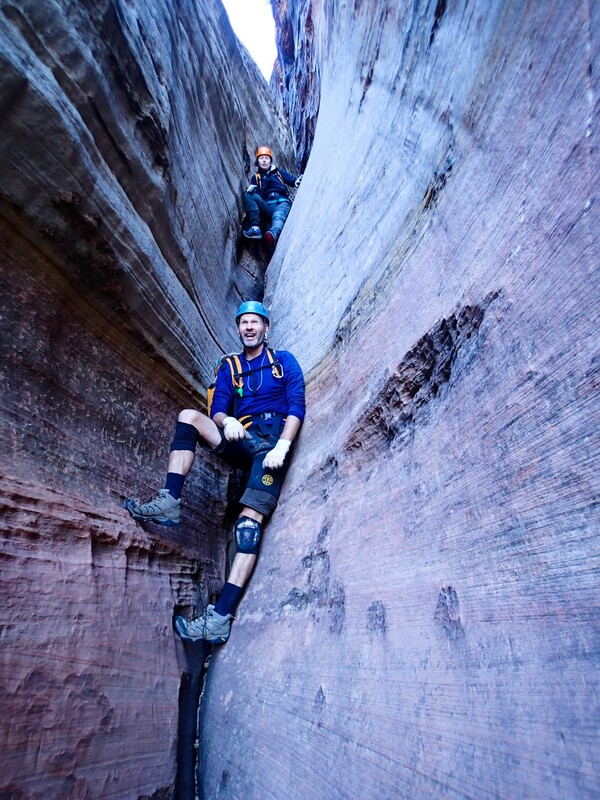 I’m no stranger to the pain and suffering that can accompany a great canyoneering adventure. The fun of sliding down slot canyons and rappelling waterfalls must be repaid with a steep hike to regain all that lost elevation. 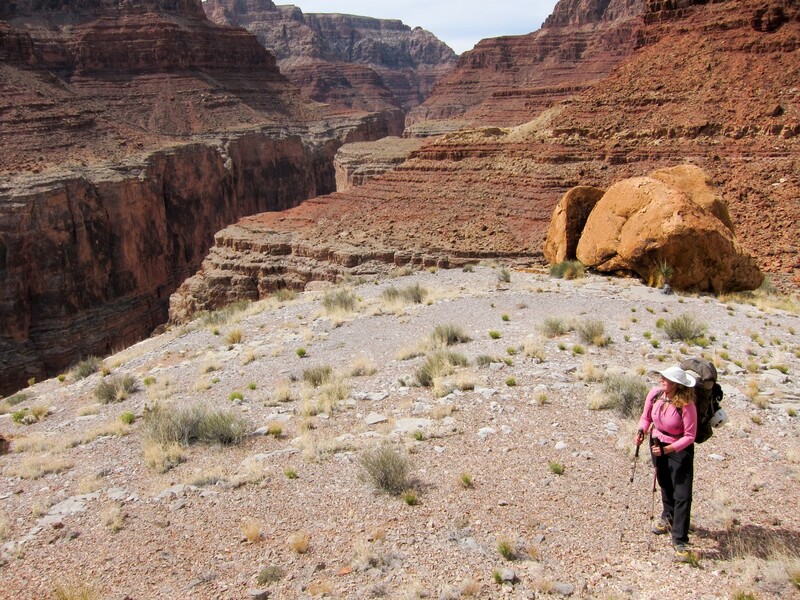 Canyoneering in the Grand Canyon serves up extra helpings of suffering, like your mother reaching for your plate with one more heaping spoonful of potatoes when you’re already full. “Really. Enough. I’ve had enough,” you plead. Your pleas are ignored and…plop. Now your plate is full again. My legs ache. My feet ache. Even my toenails ache. Especially my toenails ache. One of them aches so much I’m pretty sure I’m going to lose it. It was confined to a neoprene sock inside a wet shoe for many hours of hiking up and down steep terrain and through water filled canyons. 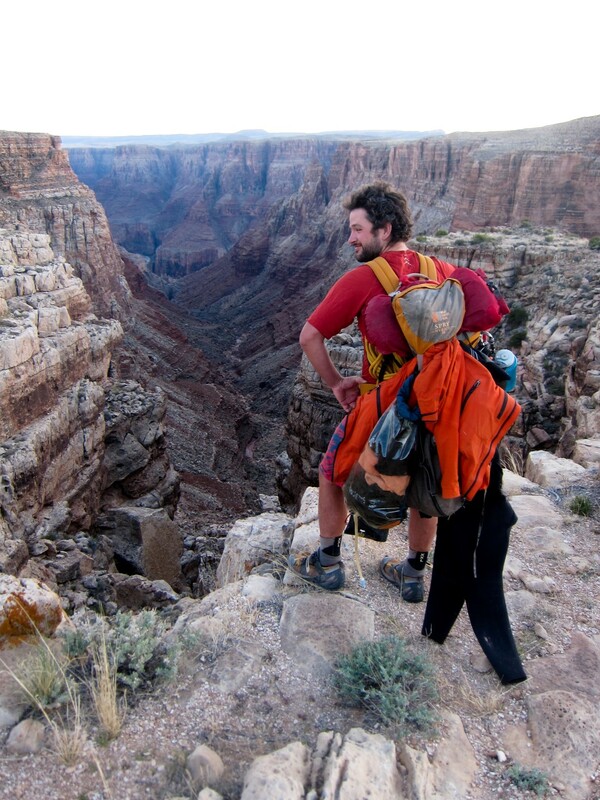 Brian and I spent two days and one night descending Big Canyon, a slot canyon buried deep in the Grand Canyon along the Little Colorado River. Our approach began at Salt Canyon Trail, as described in Todd Martin’s fantastic book “Grand Canyoneering”. Salt Canyon “Trail” descends steeply for 2700 feet from the rim of the Grand Canyon to the Little Colorado River. It was less like a trail in places and more like a jagged rock and scree covered slope. We followed this trail for about two thirds of the hike, and the other third we hiked without a trail, picking our way through the colorful layers of the Grand Canyon. 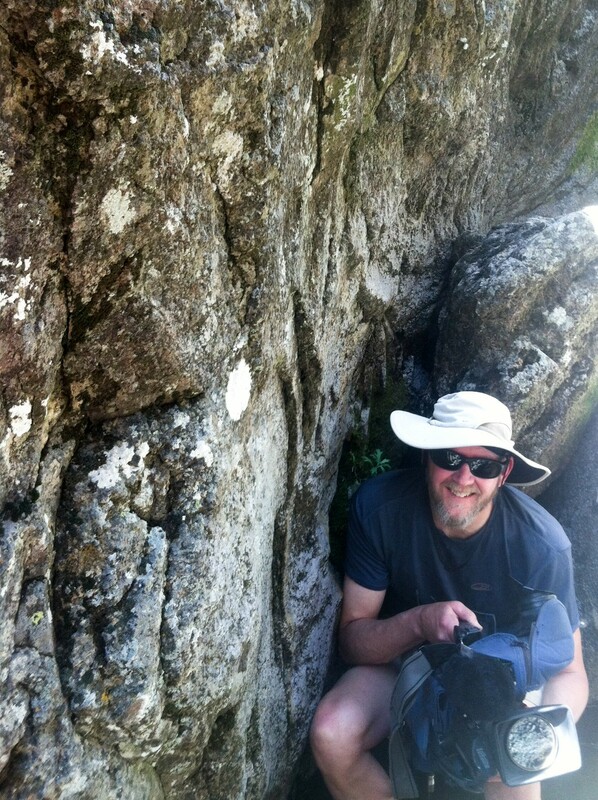 Brian did a fantastic job finding a route through the wavy layers of rock, talus, and grass. We were never faced with exposure or steep cliffs. However, we became much slower during this off-trail section of hiking as the terrain generously served up some of that extra special suffering I mentioned earlier. We climbed around on boulders and avoided the abundant thorny plants. We picked our way through this terrain for hours. I declared this canyon approach to be only for chumps. An alternate approach starts above Big Canyon, without the extra descent of Salt Canyon Trail and the physical hiking across theses layers of talus without a trail. The easier canyon approach required either two cars or a bike shuttle. Vanifest began making a banging noise as we drove the dirt road out to the Salt Trail Canyon Trailhead, so we decided to start from the Salt Trail Canyon parking area instead of doing the shorter, bike shuttled route as planned. This would avoid driving Vanifest six more miles into the wilds with curious and concerning noises coming from the front passenger axle. Anyway, after the long and arduous approach, the drop into Big Canyon was pretty incredible. The color of the rock changed from red, green and brown to orange and white once we dropped into the polished limestone curves of Big Canyon. Soon we arrived at the top of the first rappel and enjoyed the musical sounds of rushing water in the cavern below us. At the bottom of the cavern, about 60 feet below us, we could see a very clear pool. I attached my heavy pack to my harness and dangled it below me as I rappelled. I entered what is known as the “spring room” and it was like entering another world, similar to a cave but above ground. A hard, gray, rippling sheath of minerals coated every surface of the cavern where water had touched it. A couple feet above the waterline the walls were dusted with a white powdery salt. The clear, spring-fed pool was comfortable in mid-March in our 4/3 millimeter wetsuits. As I detached from the rope floating in the clear pool at the bottom, the sound of the water loudly echoed off the walls in this small space. I swam around the corner to see a white, gurgling stream gushing out of the wall and sending a gentle flow of mineral rich water down the next drop, a gently flowing slot canyon waterfall. Brian filled up all our water bottles in the spring room, noting the water had a bit of a mineral taste. To be safe, he also added iodine to the water, turning it light brown and murky. Now it really tasted funky. Hopefully at least it contained some beneficial minerals, because this would be the water we would rely on for the rest of our trip, including the 2700 foot ascent back to the rim. 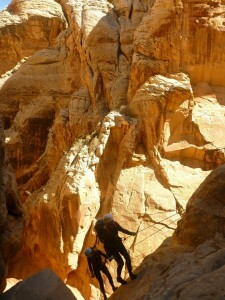 We moved down the canyon, and the other rappels in the canyon were also really nice. The mineral rich spring water flowed gently down huge travertine wedges striped green and brown. 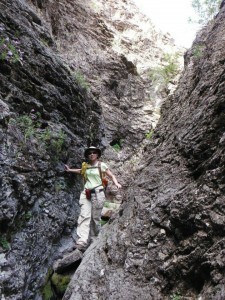 The surfaces of the travertine formations were solid and great for rappelling. Turquoise plunge pools spotted the bottom of the canyon. 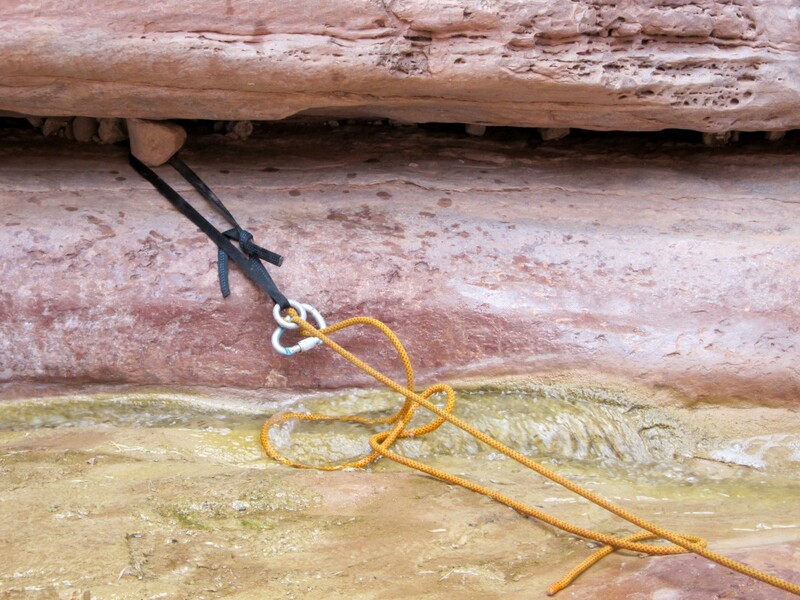 Big canyon uses natural anchors for its rappels. Most of these anchors seemed solid, and were made of webbing slung around large rocks. However, this last anchor made me a little nervous. It was nothing but a small rock wedged in a horizontal crack. And to this, we are trusting our lives? We tested it quite a bit and it seemed completely solid. I went first with both packs. Brian backed up the tiny wedged rock with his body weight to catch me if I fall, and the little rock held me and both heavy packs with no problem. There’s a picture of this little rock anchor in Todd’s guidebook, and it looks like it hasn’t changed since the guidebook was written. 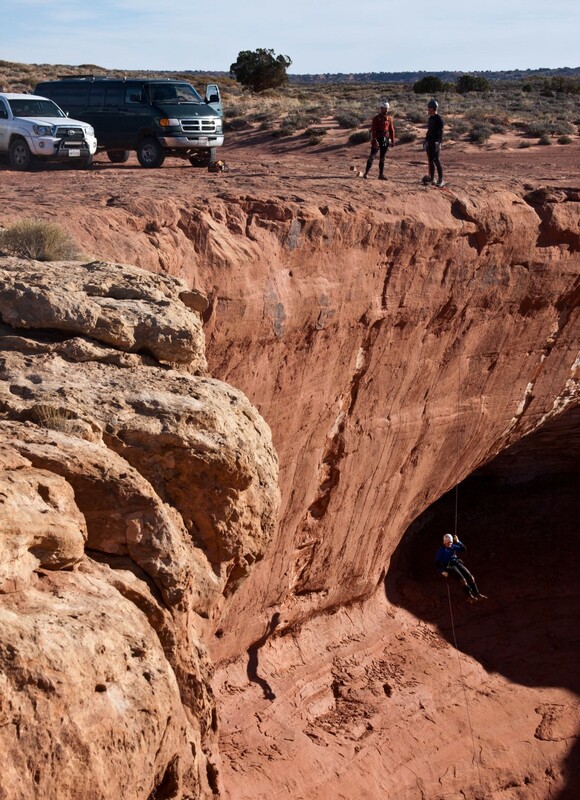 How long will this tiny rock provide a safe anchor for canyoneers and their heavy packs? It seems like it could hold for a long time, or come loose at any moment. I’m just not sure. 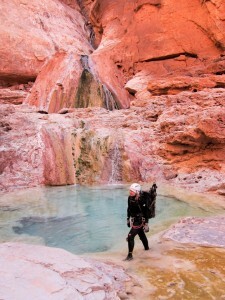 We took all our overnight sleeping gear through the canyon, rappelled waterfalls with it, and dragged it through pools. Everything was wet except the few things we had stuffed in drybags. We laid it out to dry as best as it could, then we prepared to drag all that gear 2700 feet back up to the rim of the canyon, straight up Salt Wash Trail. “Are you ready for another big helping of suffering?” asks the canyon. At least we had plenty of water and daylight for the exit hike. It was longer and steeper than any other hike I’ve done after a canyon. This trip through Big Canyon was “Grand Canyon Canyoneering Light”, too. 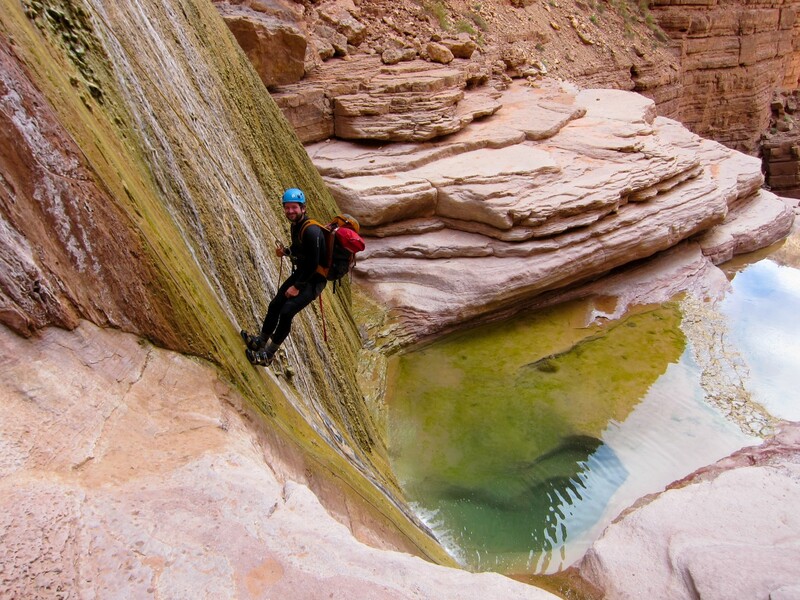 Many of the Grand Canyon canyoneering routes have ascents of 5000 feet or more! 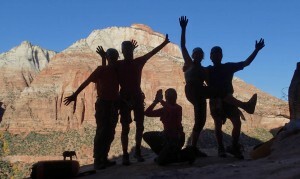 It was 6 am when friends began appearing with headlamps and big hugs for the most epic arch hike ever. In one day we descended two technical canyons, rappelled down a breathtaking 300 foot sheer wall, crossed some exposed slickrock, and even climbed a difficult chimney on belay. All to reach an arch. Whew! For a day this long, we decided to meet in the cold, dark parking lot of the Zion National Park visitor’s center at 6 am. We drove to the Pine Creek parking area and as we stood in a circle chatting before the hike, Tom dumped a huge bag with a 300 foot rope in the center of us. We all backed away as if it were a rattlesnake. No one wanted to add the weight of it to their pack for what we knew would be a difficult and risky hike. I didn’t even have a pack that day since Brian offered to carry all our gear in his pack, so I hesitantly took the big, awkward rope bag and slung it over my shoulder. 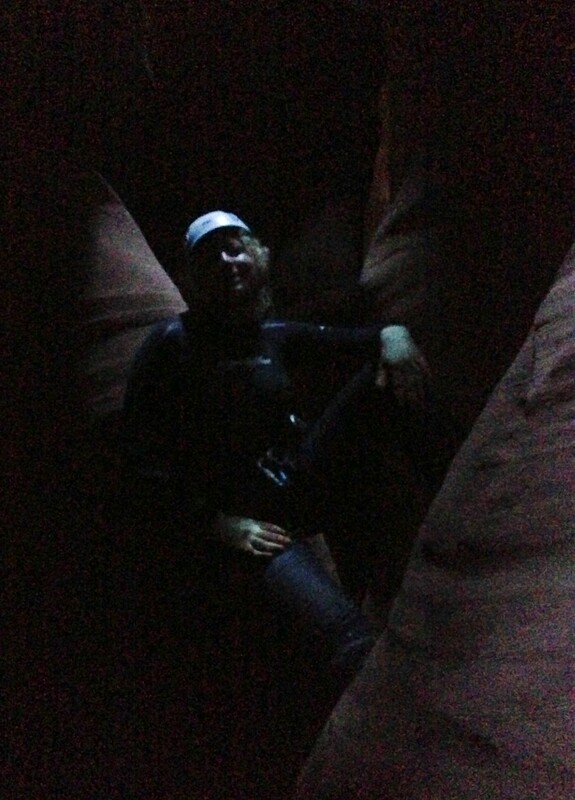 We turned on our headlamps and started down a sandy wash in the dark. The ground was littered with pretty red and yellow leaves and every now and then we would plunge into a puddle that was difficult to see in the dark. 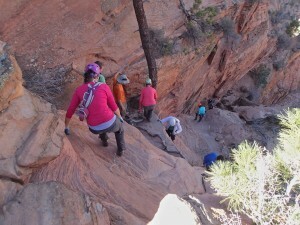 Soon we reached our turn off to a series of steep slickrock ledges and we began to climb straight up. 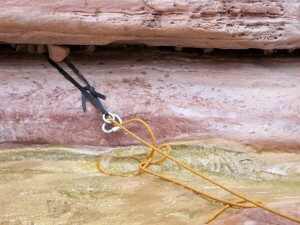 The rope bag was bouncing all over the place each time I tried to make a move up the ledges. Thankfully Brian offered to take it for awhile as we climbed the slickrock. He lashed it to the outside of his already large pack. The light began to touch us and illuminate the orange and white mountains all around us as we slowly made our way toward our first technical canyon. 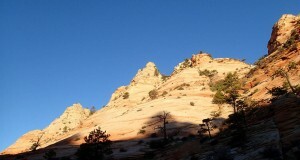 We crested the summit of an orange slickrock hill surrounded by large pine trees casting tall, dark shadows. We put on helmets and started down the canyon. It was a skinny v-shaped slot with wavy stripes of white, gray and orange which hugged our bodies securely us as we slid and scraped down, butts wedged into the slot and elbows and knees splayed out against the rock sides for traction. This canyon was basically a long controlled fall between abrasive walls, and many pieces of clothing were shredded. What fun! 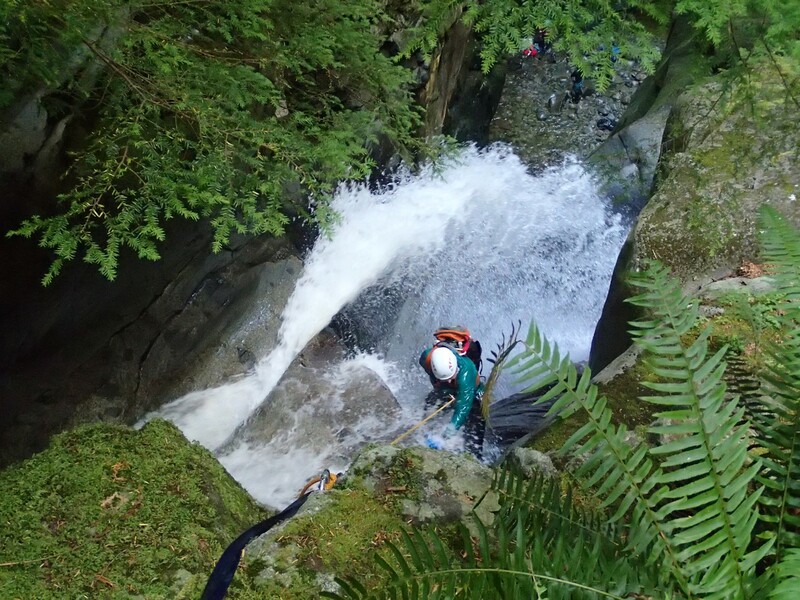 After about an hour the slot ended with a 60 foot rappel into a pool of water at the bottom. The time was only 8 am, we were in the shade, and it was still very cold. We looked at the pool with dismay, but after Louis went down first and told us it could be avoided we cheered and went down the rappel with enthusiasm. From there we still had several hours of travel to reach the arch. We followed a beautiful sandy wash with a flat, friendly floor. Big orange and white slickrock domes rose up on either side of the wash. Bright red, rust and yellow fall foliage surrounded us. Soon we were making our way up the side of Bridge Mountain. I could hear Everett say to Louis that there was some exposure coming up soon and I tried not to worry, but exposure in the Zion backcountry often means fancy moves on slickrock that could result in a long, dangerous fall should you make a mistake. We got to the part with exposure, and it required us to hike about 20 feet across a steep slickrock slope which had about a 75 foot fall beneath it. We made our way across carefully, trying not to look down. Then we arrived at the most difficult part of the hike – a rock climb in a crack with only a log wedged horizontally to help the climber get started from the ground. I put on my harness and thanks to Mike, almost all of us opted for a belay on the climb. There was no way I would have felt comfortable free climbing it. Portions of it were fairly vertical with a 30 foot drop straight down to a sharp, rocky floor. We all conquered the big climb and continued to some smaller climbs. We chose not to use a rope. Instead we pushed and pulled each other when it got difficult. Finally we saw the arch, perched high on the side of Bridge mountain. 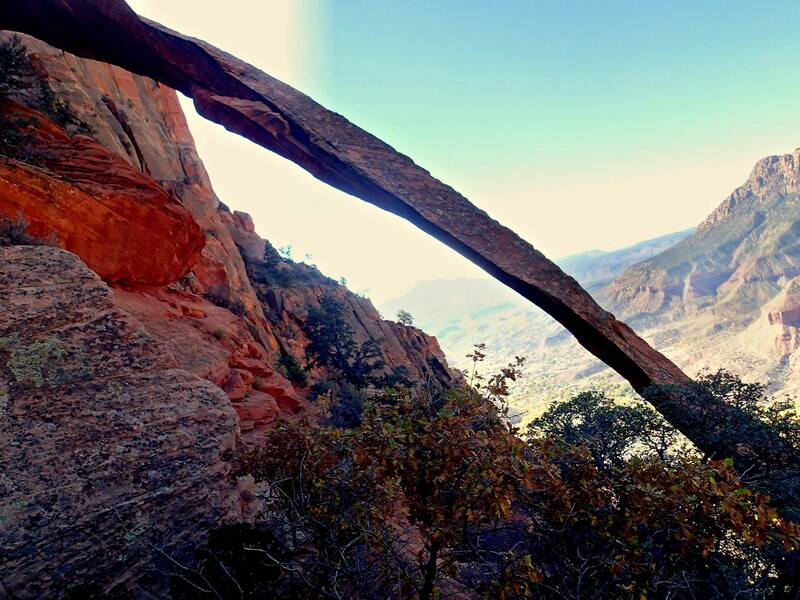 After working so hard to get there, the first glimpse of the long, skinny arch was very exciting. We all approached it differently, some gazing up at it from the bottom, some venturing out on top of it for glamorous photos. We left the arch feeling satisfied. 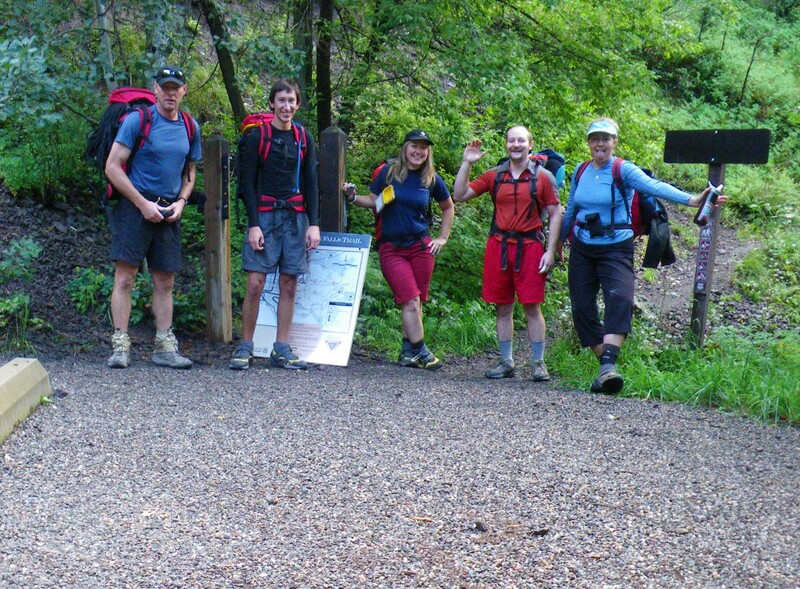 Half of the group decided to hike back and the other half prepared for the second technical canyon of the day. We rappelled down the chimney climb, then descended a very steep canyon with five rapid rappels. The last rappel dropped us right near Lori’s truck. This canyon was rarely descended and all the rappels were covered in dirt and sand. They were fun rappels, with the second to last being the most memorable. We rounded a corner and right in front of us the floor just dropped out from beneath us. In front of us was a 300 foot drop all the way down a sheer rock face to the road. We all caught our breath and approached the first stage of the rappel. The first stage was a 30 foot rappel to a ledge which was only one foot wide and a bit to the side of the fall line of the rope. 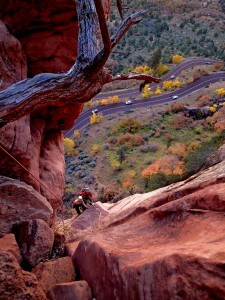 Once clinging to the one foot ledge, we hooked up to some beefy bolts for a big 300 foot rappel. As soon as I started the 30 foot rappel to the narrow ledge, the world dropped out from beneath me and there was only 330 feet of air. I aimed for the one foot wide ledge and Louis grabbed my harness to pull me onto it. We probably should have tied a knot in the end of the rope for that first 30 foot rappel, we realized afterward. A mistake on that little rappel would have been fatal. 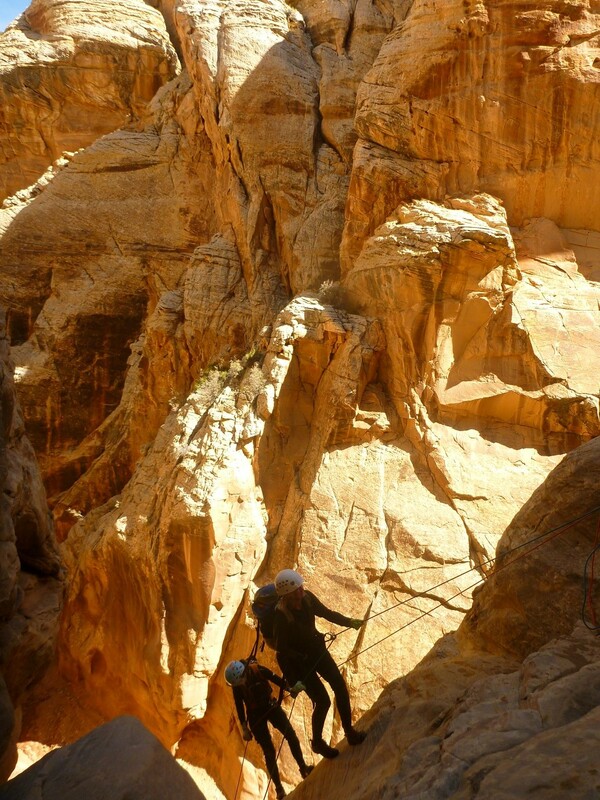 We carried two 300 foot ropes so we could set up a simultaneous rappel for the 300 foot drop to the floor of the canyon. Louis and I both got on rappel and sat on the ledge together, ready to descend. He slid over the edge and I followed close behind, until we were both perched right below the edge on our ropes, legs dangling with 300 feet of air beneath us. What fun to share such an exhilarating experience with a friend, side by side. I’ve never done a simultaneous rappel before and I highly recommend it. It’s especially great during a big, airy, exciting rappel because instead of talking myself through it to stay calm, I had a friend right there to chat with and point out every ledge, every overhang, every change of friction. We rappelled side by side as much as possible due to the danger of rockfall should one person get ahead of the other, so there was constant negotiation. It was a wonderful 10 minutes on rope and at the end we were happy to finally have our feet on solid ground again. Once Brian and Lori made it down, a 30 minute photo shoot followed as we celebrated our big rappel. Lori’s little friend named Elephant even made it into the shot. He accompanies Lori on all her best adventures. We then continued down the rest of the way and enjoyed a nice dinner all together in Springdale. The highlight was ordering two huge desserts and sending them all around the table for everyone to nibble until they finally disappeared. 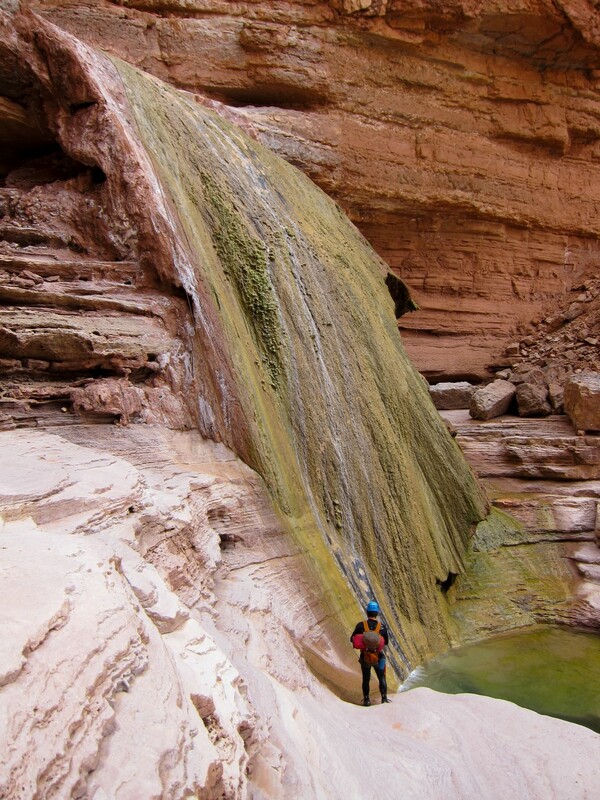 Prankfest is a unique, three day canyoneering party in a very remote location with 40+ attendees. It’s organized by a couple of dear friends who are full of fun and pranks. Nice pranks. That is the only rule of Prankfest. The first day we did High Spur canyon. It involved a grueling 1.5 hour drive on terrible roads and one member of our party sacrificed an oil pan and needed to get towed from the middle of nowhere at $200 per hour. Ouch. 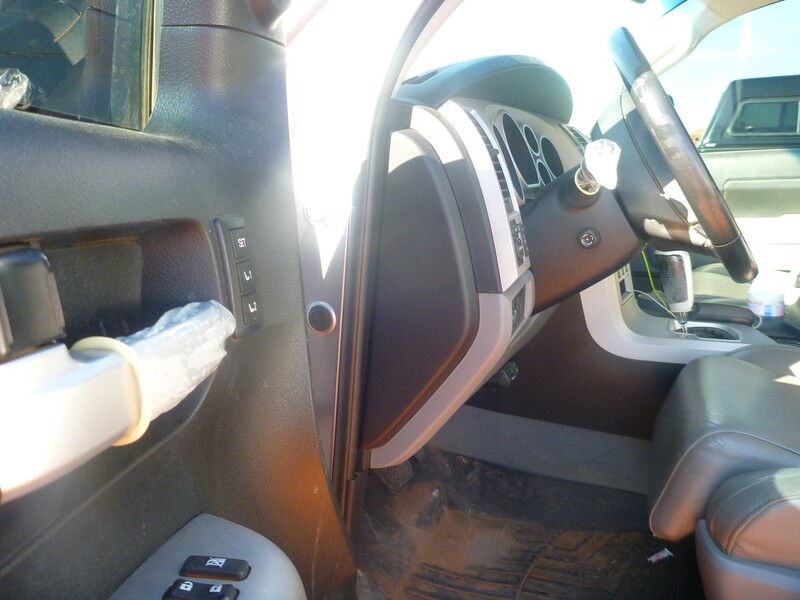 Once we made some phone calls and got help for the injured vehicle, Dylan asked for my help pranking one of the vehicles at the trailhead and we installed over a dozen condoms on every phallic shaped item in the vehicle, even the beers in the cooler. 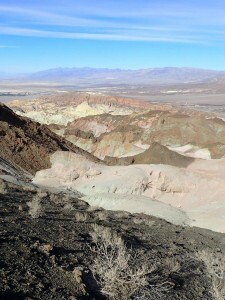 I began the hike toward the canyon snickering, wiping my hands on my pants. They were covered with sticky lube from the condoms. High Spur was one of the most beautiful slots I had ever seen. The narrows were perfectly sculpted, wide enough to walk through easily, and very picturesque. 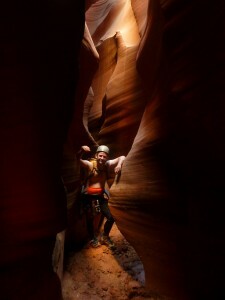 We enjoyed a couple open spots in the canyon before heading into more deep, glowing narrow sections. After most of the narrows were behind us, there was a gorgeous break in the slot where we ended up in a large, striped cavern with light streaming in through the ceiling. Brian and I were in the lead at that point as we pushed through some small pothole sections with waist deep, rust colored water. 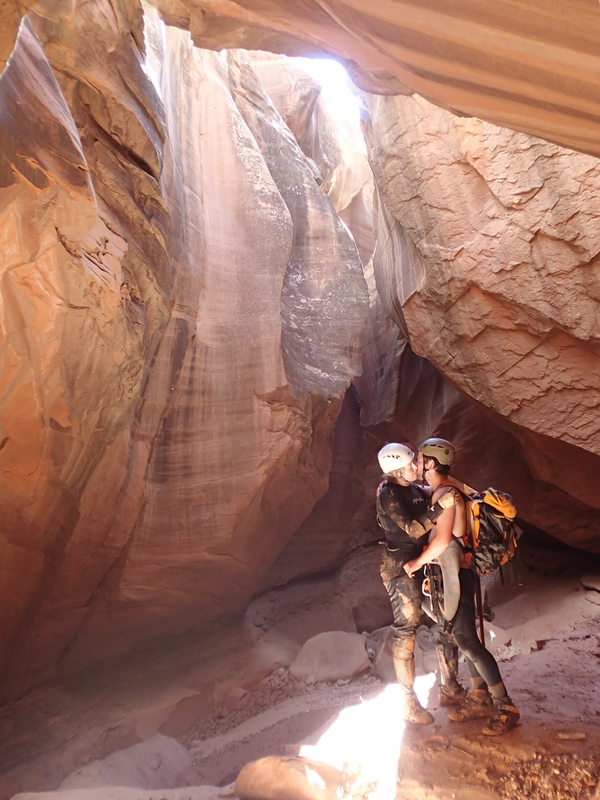 We exited the difficult section and celebrated the beauty of the cavern with a wild make out session. Our friends caught up to us and we were officially busted as we celebrated. I was torn about what canyon to do the next day. Alcatraz is said to be a great canyon but it has some sections which can be very difficult to pass through. Everyone always talks about the ultra-skinny sections in this canyon, and there had been a chilling rescue there recently. A man had become severely wedged in the slot. After hours of struggling, his canyoneering team still could not free him from the constriction. He remained trapped and ended up spending a night alone, wedged in the canyon. He lived to tell the tale, thankfully. I’m not the smallest person and have certainly gotten stuck in canyons before. My sticking point is always my rib cage, which is a very unfortunate place to become lodged because it becomes difficult to breathe as the two rock walls of the canyon compress my lungs more and more with each exhale. Every time I let out my breath, my chest shrinks just a bit and there’s the potential of slipping further into the constriction. It’s a nightmarish scenario which is best avoided. However, my friend Adam is a little bigger than me and planned to descend Alcatraz that day. He’s a skilled climber, able to go over constricted areas rather than through them, and I decided I would do whatever Adam did. If he climbs high over a skinny spot, I climb high. If he fits through the canyon, I know I can fit. I would be proactive in avoiding the skinny sections by going up and over them, rather than trying to fit through and learning too late that I’m trapped by this cruel, unforgiving rock slot. We drove to the beginning of Alcatraz and Brian set up my bright purple rope on Vanifest for the big, overhanging, 100+ foot entry rappel into the deep, dark slot below. Vanifest was the biggest, creepiest vehicle present so it was chosen as the rappel anchor for this drop. We all moved down canyon. I made sure Adam was ahead of me so I could watch his progress through the thinner sections of the canyon. This was going well. I was climbing up between the narrow walls of this very dark slot canyon, sometimes gazing down 30 feet into the abyss below with my back on one wall and my feet on the other. Should I slip, I will surely become lodged deep in the canyon and need either a lot of help from my friends or a visit from Search and Rescue. It was risky, but as I was doing it the moves felt completely within my abilities. I sailed through the canyon with plenty of help from Brian and a push or pull from a couple other canyon members. I would call out to Adam ahead, “Did you fit through this?” When he would say yes my heart would soar. When he would say no I would start to climb up rather than plow right into it and get stuck. I did get stuck at one point. After an hour in very dark narrows, the canyon presented us with a dramatic pinch point and there was no easy way to climb over it. I call this the crux. I began in a pool of knee deep water and needed to climb up a skinny crack in the wall to get up and over the pinch point. Or so I thought. This pinch point was 15 feet in the air, and Brian helped me push myself up and over it. Only that didn’t work. My rib cage was wedged in it as I tried to move through. Kristin, on the other side, offered a hand, a foot, anything to get me through. I reached out to her, but grabbing her hand didn’t help me move. All other parts of my body could wiggle, but my chest remained wedged and it was getting difficult to breathe. Getting stuck is so embarrassing and inconvenient. I’ve never found it to be scary, because there are always at least two people pushing and pulling on me when it’s happening, and I somehow find that comforting. I was covered in sweat, trying to move up, move down, do anything to get my chest out of that pinch of rock while my legs dangled freely and uselessly. The whole ordeal only lasted a couple minutes before I discovered the only way to move my chest through the pinch was to slide diagonally downhill. Once I found the correct angle I shuffled right through the rock pinch. Next time it will be easier, but the first time through it was hard to know exactly what to do. It was such a relief to escape the pinch and see the canyon opening up with orange light in front of me. Kristin and I sat and celebrated at the side of the canyon with some water. The adrenaline started to dissipate from my body and I moved downcanyon to a celebration party where we all changed, ate snacks and enjoyed various treats. Wiggling through that pinch with the help of my dear friends was an excellent climax to the weekend at Prankfest! I’m so glad I did Alcatraz, because then my friend Dean invited Brian and I on a descent of Pandora’s Box Canyon, a challenging and famous skinny slot in Capitol Reef. Every canyoneer is interested in opening Pandora’s Box, but you must be ready for it or it will inflict endless misery upon you. It is said to be the best Wingate sandstone slot on the Colorado Plateau, so I decided to give it a shot with an excellent, experienced canyon team. To quote Dean, “The activities we enjoy are the things that most people would give up everything they own to avoid.” This statement pretty much sums up a descent of Pandora’s Box Canyon, which would be a frightful and grueling experience (if not downright impossible) for the average person. Our descent of Pandora’s Box involved more exposed climbing than I had ever done before and at one point I found myself 40 feet off the ground, feet on one wall, back on the other, shuffling sideways with my pack dangling beneath me on a piece of webbing. I didn’t take many photos that day. The air temperature was only about 45 degrees and the canyon was cold and dark. It also had many difficult problems to solve and many extremely awkward sections. This canyon definitely had my full attention and my camera was forgotten. I was mainly just trying to stay alive. Our descent of Pandora’s Box was relatively drama free, thanks to our skilled team and our constant vigilance. It was a 10.5 hour day out, and well worth the effort for the chance to see this amazing slot I have always heard so much about. We moved efficiently and felt proud of our time descending the canyon. Usually this trip takes canyoneers 11-12 hours, and we also spent at least 30 minutes dislodging a wiggling, 100 pound rock which threatened to come loose and kill someone on the last rappel. We enjoyed a gourmet meal at Cafe Diablo in Torrey, Utah, and felt entitled to a decadent dessert as well before we hobbled back out to our cars on very tired legs. I love waterfalls. 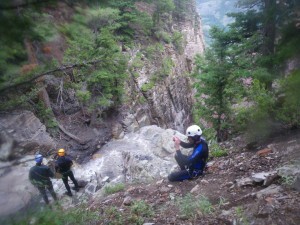 My first big, gushing waterfall rappel was in 2010 in Cascade Canyon, Ouray, Colorado. After I felt it’s frenetic energy gushing all around me as I dangled on a rope, I couldn’t look at a waterfall the same way again. Now each time I see a waterfall, I imagine how it would feel to rappel it. I’m ruined. I can’t simply appreciate the aesthetics of beautiful, falling water. I want to attach my rappel device to the rope at the brink of the falls, then feel the water surrounding my ankles as I step into the flow. Then, as I begin to walk down the waterfall my legs become invisible and I am blindly feeling my way with my feet on the rock wall behind the water. If it’s a big waterfall, eventually the water will splash out from the wall and fall all over my head, splashing off my helmet. The water droplets on my plastic helmet sound like loud rain on a tin roof. 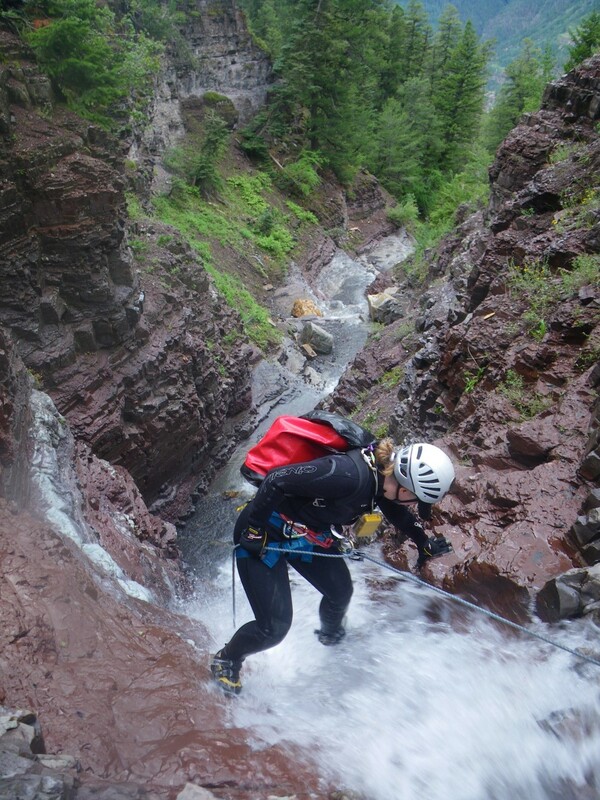 Sometimes, in the middle of a long rappel in water, I can see that I’m about to drop into an especially chaotic stream of water right below me. The sight is intimidating. The water shoots in several directions at once. I take a deep breath and move into the chaos. Everything becomes white. I can’t control my movements and rather than fight against the force of the water, I let it push me down the rope. I’m disoriented as I get pummeled by many overlapping curtains of white, pushing me around and trying to get into my mouth. 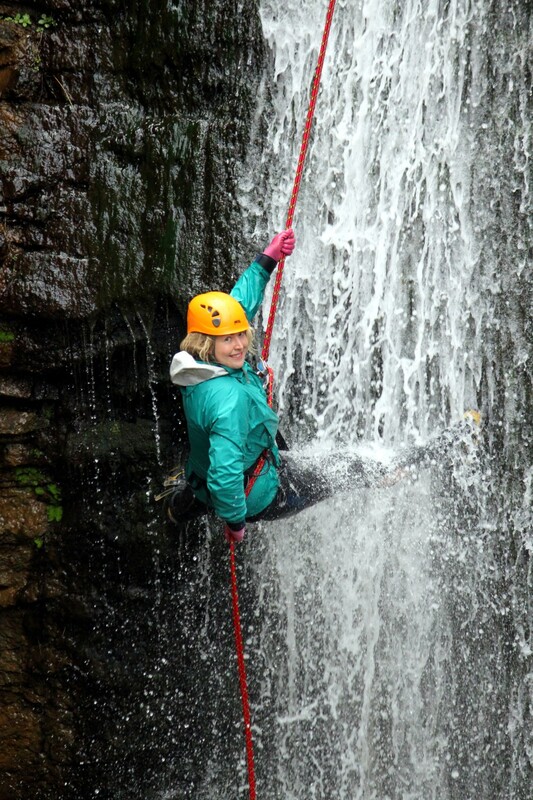 When I splash into the pool below the waterfall, I quickly let rope out through my rappel device to get away from the pounding flow. I swim backward as quickly as possible and catch my breath. At this point I’m still attached to the rope, floating, twisting the lock on my carabiner and trying to stay out of the flow as I get free of the rope. To call an experience like this “intense” is an understatement. Rappelling a pounding waterfall takes me out of my body for a few moments, and I have no choice but to join the water and do as it does. Then, at the bottom of the waterfall, floating in the pool, I regain control of my body and wipe the water from my lips. I stand on my feet and look back at the waterfall I just rappelled, knowing much more about it than would ever be possible by viewing it. I know how cold it is, how it feels to be right in the middle of its flow, how it looks from the top and from the bottom. This is experiencing a waterfall completely. Seeing a waterfall from an overlook is beautiful, but after rappelling a waterfall you know the overlook is only revealing about 25% of the waterfall’s magic. To experience the other 75%, you need a rope. It all started at Freezefest around a huge campfire. Snow, frozen water and zero degree temperatures attract a group of slightly insane canyoneers to the annual New Year’s festival called Freezefest. It takes place each year in Southern Utah. 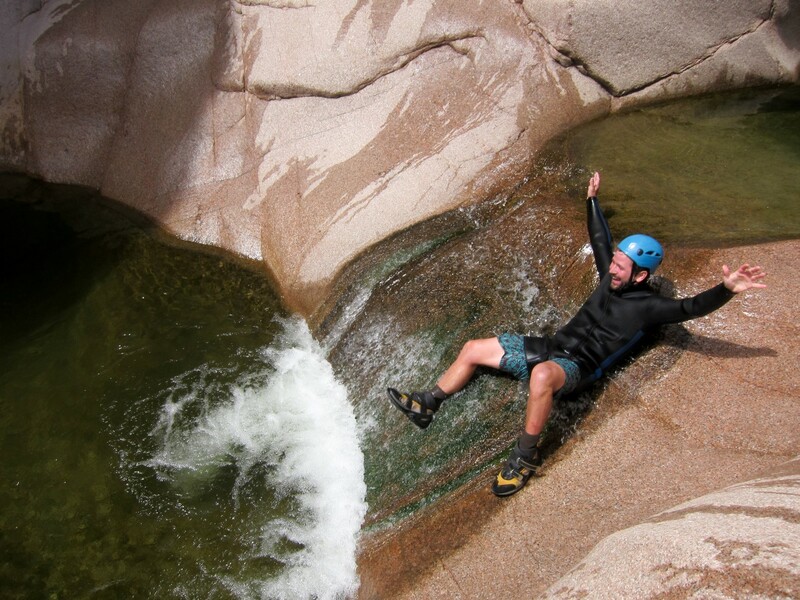 “Water canyons in Mexico this summer, who’s in? !” says Matt. “Stoke-O-Loco!” becomes the name of the event. We start to plan our Mexico canyoneering trip. We’re stoked until we find out how much it costs to go to Mexico. 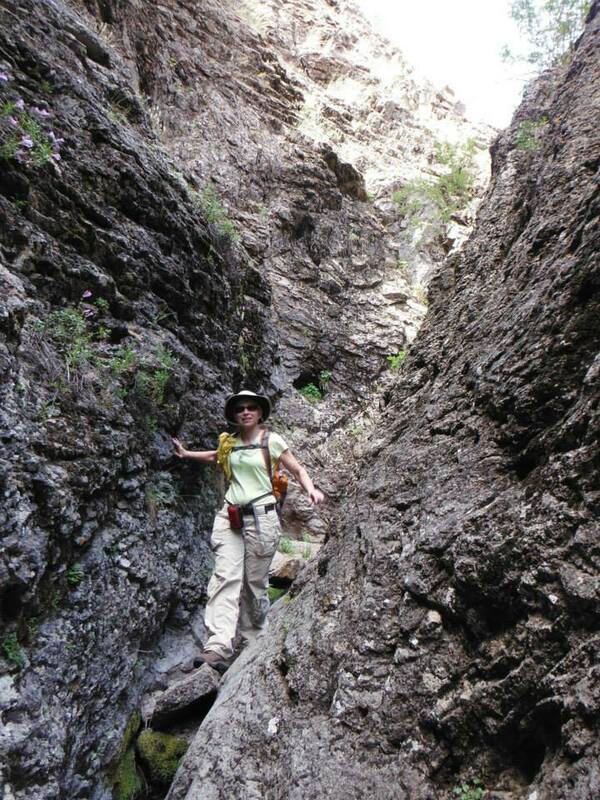 High alpine canyons in Colorado become the plan instead. Now it’s “Stoke-O-BROKE-O” in Ouray, Colorado. Fast forward eight months. It’s August in the high mountains of Colorado. Stoke-O-Broke-O is here. It rained this morning and clouds still cling to the steep peaks surrounding the small town of Ouray, Colorado. 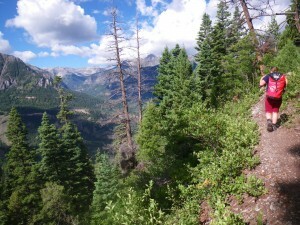 I drive my van to the trailhead of Cascade Canyon and meet AJs group. They depart, and a few minutes later the “Stoke-O-Broke-O” group starts showing up. Matt, Mark, Randi and I are feeling stoked as we pack our gear. Mike pulls in. He just drove all night from Flagstaff, Arizona. He’s pretty stoked, even after zero sleep. He quickly packs his stuff and we are ready to go. We shuttle in my van (called the “free candy van” during this trip) and start up the trail. It slowly climbs 2300 feet with great views of the surrounding mountains. I like these approaches, where you do all the climbing at the beginning of the day. When we exit the canyon we’ll be right near our cars and a tasty restaurant, says Matt. Perfect. 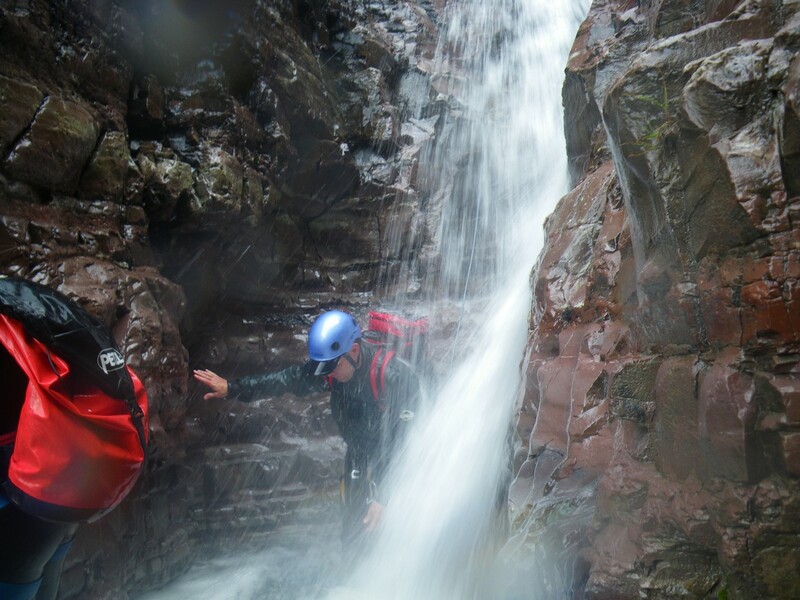 We get to the start of the canyon and wiggle into our wetsuits near the top of a 25 foot waterfall. The soft white water gently pours over a wide lip. Below lies a floor of colorful rock divided by white rivulets of rushing water and then the canyon drops steeply out of sight. The recent rain makes the rock look polished. The saturated surfaces of the rock shine with tones of rusty red, soft green and dark gray. 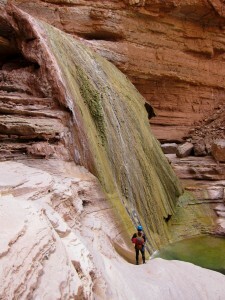 We enter the canyon and enjoy several rappels near waterfalls, but not actually in the water. The rock is very solid and perfect for downclimbing. On some downclimbs my legs are obscured by gushing water, splashing in the air, tugging at my feet. I’m accustomed to using my sense of sight for downclimbing. Downclimbing in flowing water requires use of a different sense – feeling. I feel with my feet and find my way down rocks I can’t see. Small balls of white hail erupt suddenly from the sky. We laugh and Mike shoots a short video of the hail. Three separate times that day the sky opens up suddenly with a dramatic hailstorm. Clouds pass over, the sun comes back, rain, hail, repeat. The weather holds more surprises for us later on. 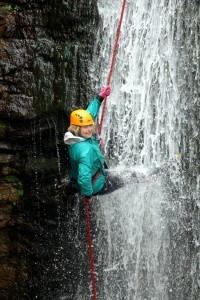 A drenching waterfall rappel appears in front of us and Matt gets the rope out. It’s only about 30 feet but it will be my first rappel into a heavy flow of water. I wonder if I will be able to breathe once I get into the thickest part of the waterfall. How hard will it push me down the rope? These are the things I’ve been warned about when rappelling in flowing water. 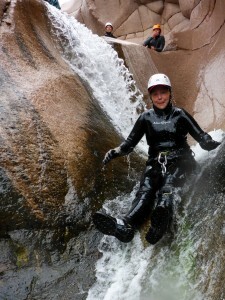 I rig high friction on my rappel device and drop down into the rushing water. It shoots down the back of my wetsuit, intensely cold. I love the sound of the water splashing loudly off my plastic helmet, like standing under a tin roof while it’s raining. Cold sheets of water hit me in the face, but I can breathe when I need to. I like this. It starts to rain. The canyon is especially lush after the recent rain. Pine trees and bright green bushes crowd the rim of the rocky canyon, and occasionally a glossy green plant clings to the rock down in the watercourse. Despite the cold weather and complete lack of sleep for one of our friends, our laughs and smiles warm the canyon and we forget about the cold. 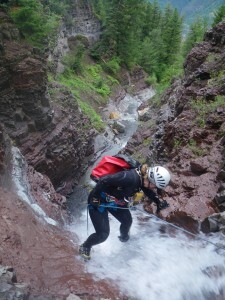 We stay busy on many fun, wet downclimbs and numerous short rappels. We arrive at the 150 foot waterfall and find AJ. He’s the last in his group to go down, and he’s just getting on rappel. The sun shines as we get ready for the first of seven remaining rappels. The grand finale of the day will be a 300 foot waterfall – Cascade Falls. Randi goes to the top of the falls and starts to get on rappel, then stops. Then, Matt is nearby so he decides to go first. Matt gets on rappel. This takes about a minute, and neither of them knows it but in about a minute and a half the creek will start to pulse. I am standing off to the side of the waterfall, watching. As soon as Matt starts to drop over the edge the flow increases and softball sized rocks start tumbling down the stream with the current. Danger. Matt scrambles hand over hand up the rope. I can’t hear anything above the sound of the water. I can just see the look on Matt’s face, and he is not stoked. He points at the rocks tumbling in the water, mouth open, yelling. The next couple seconds pass in slow motion. I see Matt at the top of the falls, now standing on solid ground. The creek suddenly changes color to a milky, chocolate brown. It could flash flood at any moment and I’m standing on the brink of a 150 foot waterfall. I think back to all the debris we saw in the canyon from previous flash floods. These facts combine in an instant, and I leap into action and fly up the rock to the side of the falls, then up a dirt slope. I don’t even bother to put the items back in my pack. I just toss them up the slope in front of me. We all claw our way up the hillside and perch on a dirt slope, safely and helplessly watching the creek increase in volume. The flow isn’t huge, but it’s about double what it was earlier. That’s a lot for this canyon. We cower beneath big trees, and a light rain shower trickles between the branches. We put on extra clothing and I feel relieved and safe, laying there under the trees. Mike notices a large, brown, sparkly geode nearby. We admire it. Right as we’re starting to relax, thunder booms right near us. The whole canyon trembles. Is it better to be on the slope or under a tree? There’s nowhere else for us to go. Neither seems ideal, so we decide our strategy will be to hope. We sit and hope lightning won’t strike as thunder booms all around us. The storm passes. We watch the creek decrease in volume over the next hour and we talk about getting ready to rappel. Suddenly, the flow increases again to the same level as before. The water continues to move softball sized rocks. We have seven rappels ahead of us and the sky is gray and misty. More rain is coming. We can’t do these rappels right now. We talk about how to help AJs group below us. 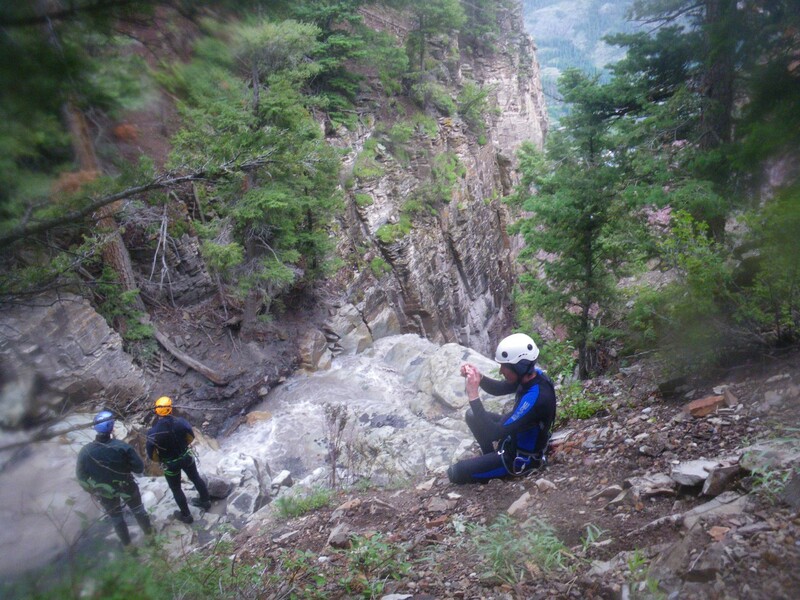 They are between two of the long waterfall rappels, and might be stuck there until the creek mellows out. While the canyon is raining drama down upon us, we remain calm. A couple people even take a short nap on the slope. No one complains, although we realize the situation could lead to an uncomfortable bivy or difficult exit. I feel thankful to be with this positive group. Matt is trying to find a solution. He stands at the top of the waterfall trying to communicate with AJ down below. The rope became wedged in the rock as the creek surged, and now it’s stuck somewhere in the middle of the falls. Matt yanks on it for several minutes. Finally it comes loose. A long session of “canyon charades” ensues, which we watch with great interest. Matt is standing at the top of the falls trying to discuss options with AJ, at the bottom of the falls. Only they can’t hear each other. The water is too loud. Matt uses facial contortions and wild arm movements to say everything from “do you want me to pull the rope”, to “let’s meet at the bar later on” and everything in between. After several minutes, an agreement is flailed out between AJ and Matt. The waterfalls are too dangerous if the creek continues to pulse. AJs group will attempt to hike out. We’ve been sitting by the creek for an hour now. We decide we should try to hike out, too. Matt apologizes to us for not completing the canyon. Even the half of the canyon we saw, which was the mellow half, was incredible. It had still been a pretty awesome day, overall. Now, the unknown exit lay ahead of us. As we sit on the slope, we eye a broken down cabin across from us on the hillside. Mark hikes up to the cabin debris and finds a large cast iron stove which had to be hauled in somehow. “It sure didn’t come down the watercourse,” Mark says and we giggle. We’re still in good spirits. We hope there might be an old trail somewhere. We go up the hillside and pick our way across the front of the mountain. We find a faint trail and it’s definitely a welcome route across the steep and rocky terrain. We follow the faint trail for about an hour, then rejoin the main trail. We hike the rest of the way out, and are happy to see AJ at the lower trailhead. Everyone is safe, although it sounds like AJ’s group had a rougher hike out than we did. They hadn’t even changed out of their wetsuits before the hike because there wasn’t even a good place to do it. I guess we got pretty lucky with our route. At the end of the day, we feel good everyone is safe. I think about the tiny events which protected us that day. I thought about the delay getting on rappel at the waterfall right before the creek pulsed, our trail in the middle of nowhere, and the safe exits found by both groups. Cheers to a memorable day in Cascade Canyon! 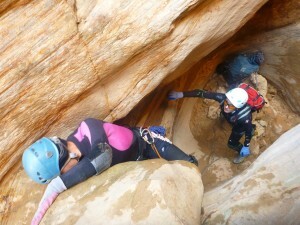 Last weekend I got to go canyoneering with 38 other women in southern Utah. We rappelled, climbed, hiked, swam and had a fabulous potluck and fashion show. It was pretty inspiring to see so many amazing women in one place with wetsuits, climbing gear, and a thirst for fun and adventure! Non-canyoneers might be lucky enough to encounter just one or two of these strong, fierce, loving women in an entire lifetime, as we lady canyoneers are obscure and few. To see us all together, donning ripped clothing and dirty hair, laughing and assisting each other through slot canyons, was breathtaking. The most touching moment of the weekend happened when I realized I forgot my wetsuit for a canyon which requires hours of swimming in cold water. I had just hiked over an hour up a steep, rocky slope to enter a six hour canyon called Knotted Rope when I realized the wetsuit wasn’t in my pack. While I’m not especially afraid of cold water, I was nervous about hours in it with no escape and the possibility of hypothermia when I needed full dexterity to climb out of narrow canyon constrictions. “I don’t know what happened, but I must have forgotten my wetsuit this morning”, I quietly admitted. The ladies around me immediately started rooting through their packs for spare gear to keep me warm, and within minutes I had a fleece shirt, a pair of neoprene shorts and a rain jacket. These items, combined with my neoprene socks, neoprene vest and wool hat kept me warm all day and a crisis was averted. I was even warm enough to slow down, have fun, help others, and take photos in a beautiful canyon filled with what canyoneers call “potholes”. A pothole is a rounded depression in the rock which usually holds water. The water can be ankle deep or deep enough to swim. That day the the potholes were very full from recent storms. All day long we slid into these potholes and climbed back out, giggling and helping each other every step of the way. We would grab the top of the pack of the lady in front of us and dangle her like a marionette as she dropped into the pool. By doing this, we avoiding dropping in over our heads into the chocolatey brown water and getting it in our mouths. Even expert canyoneers don’t relish the idea of dropping into a pothole and coming up with a mouthful of dirty canyon water. 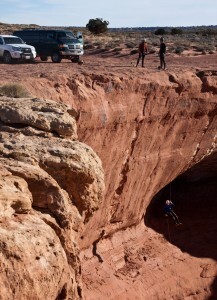 The next day over a dozen of us bounced on horrible 4×4 roads to reach a canyon called Baptist Draw. 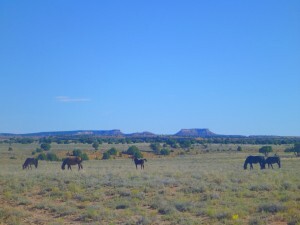 We saw a half dozen wild mustangs galloping across a high desert plateau on the way to the canyon. 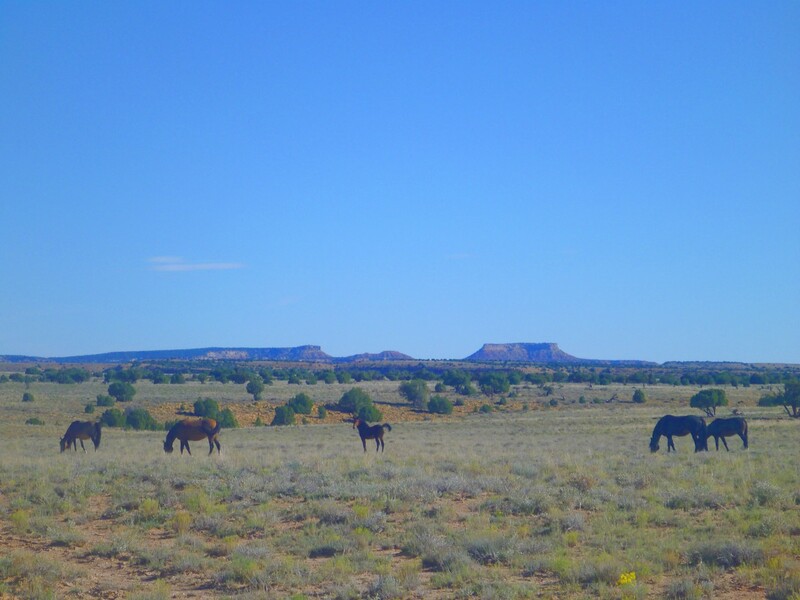 I’ve heard many rumors about these horses roaming around the San Rafael Swell but this was my first sighting. They were wild and free, unafraid of us. At the beginning of Baptist Draw, one of the ladies announced it was her friend’s very first canyon. 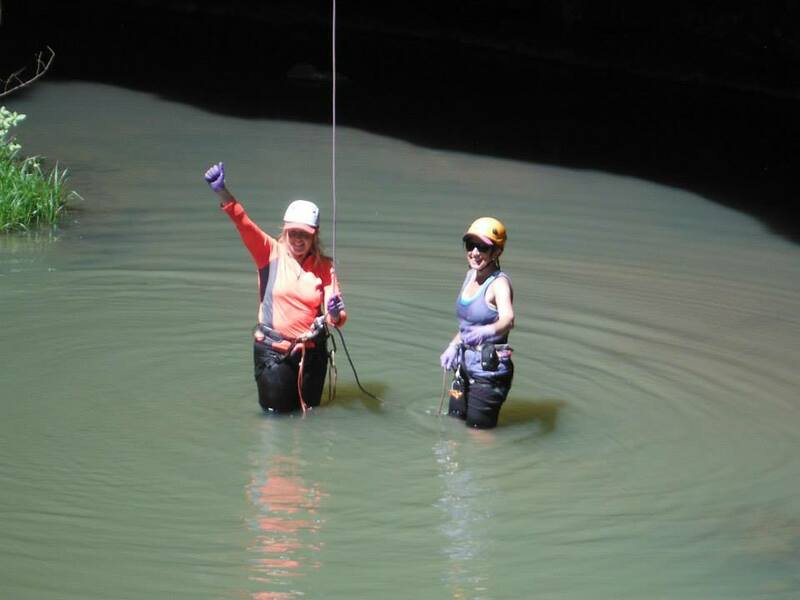 We all cheered and celebrated, happy to be part of this woman’s first canyoneering experience. You never forget your first canyon! Our beginner was already a strong climber and cruised through the canyon as we assisted and gave verbal instruction and encouragement. When she came up to the big 83 foot rappel, it was an exciting moment. 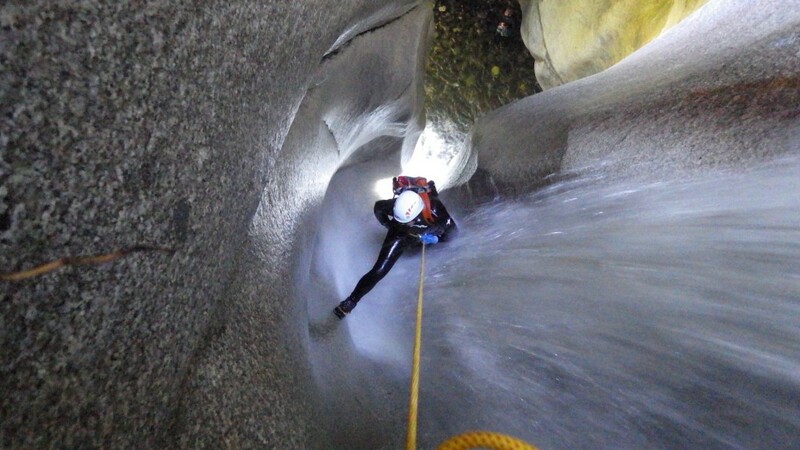 “This is it, this is the big rappel”, her experienced canyoneering friend said as they both stepped up to the steep, open drop. This rappel had been set up with two independant ropes so two people could rappel side by side. The new canyoneer got on one rope and her friend got on the other. They both rappelled down together, side by side, smiling and sharing a very special canyoneering moment. 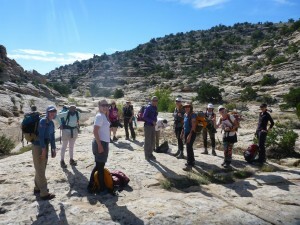 After the big rappel, we continued up Chute canyon and enjoyed plenty of challenging upclimbs which became difficult after a few people had climbed up and left slippery mud on the walls. Our teamwork included knees to step on, ropes to climb up, and even mighty pushes on wiggling butts to ascend tight spots. We giggled as we pushed and pulled each other up these climbs. Canyoneering is just different with a team of all women. Love is in the air as we wiggle through slots wearing dirty wetsuits and helmets. We bring playfulness, caring, and a slower pace to the canyon as we move through the twisting slot as a group with many experience levels. We all know we’re united in this experience. We keep the mood high and the canyon fun with smiles on every face, even when we’re fighting for a foothold on a slippery, muddy upclimb over a huge rock. 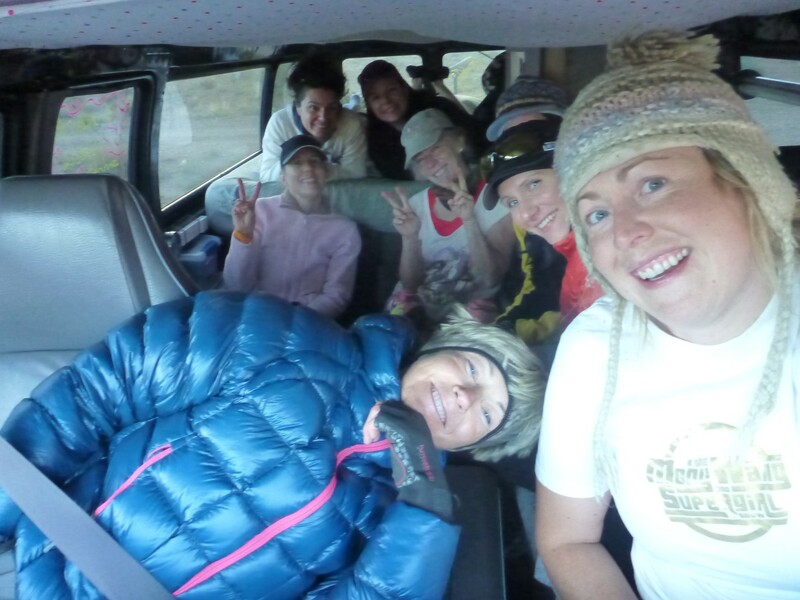 To finish this blog post, here is one of my favorite images from the weekend: my van filled to the brim with spectacular women ready for a day of canyoneering! We piled into my van, sitting on the bed, couch, and camp chairs. Together we bounced along a rough 4×4 road into Baptist Draw canyon. I am in awe of these women. I drove away from this gathering filled with love for canyons and for my network of fellow female superheroes.